RESULTS: For recent-onset (0-3 months) neck pain, we suggest offering multimodal care; manipulation or mobilization; range-of-motion home exercise, or multimodal manual therapy (for grades I-II NAD); supervised graded strengthening exercise (grade III NAD); and multimodal care (grade III WAD). For persistent (>3 months) neck pain, we suggest offering multimodal care or stress self-management; manipulation with soft tissue therapy; high-dose massage; supervised group exercise; supervised yoga; supervised strengthening exercises or home exercises (grades I-II NAD); multimodal care or practitioner's advice (grades I-III NAD); and supervised exercise with advice or advice alone (grades I-II WAD). The 2000–2010 Bone and Joint Decade Task Force on Neck Pain and its Associated Disorders recommended that all types of neck pain, including WADs,  be included under the classification of NAD. NAD can be classified into 4 grades, distinguished by the severity of symptoms, signs, and impact on activities of daily life (Table 1). The clinical management of musculoskeletal disorders, and neck pain in particular, can be complex and often involves combining multiple interventions (multimodal care) to address its symptoms and consequences. 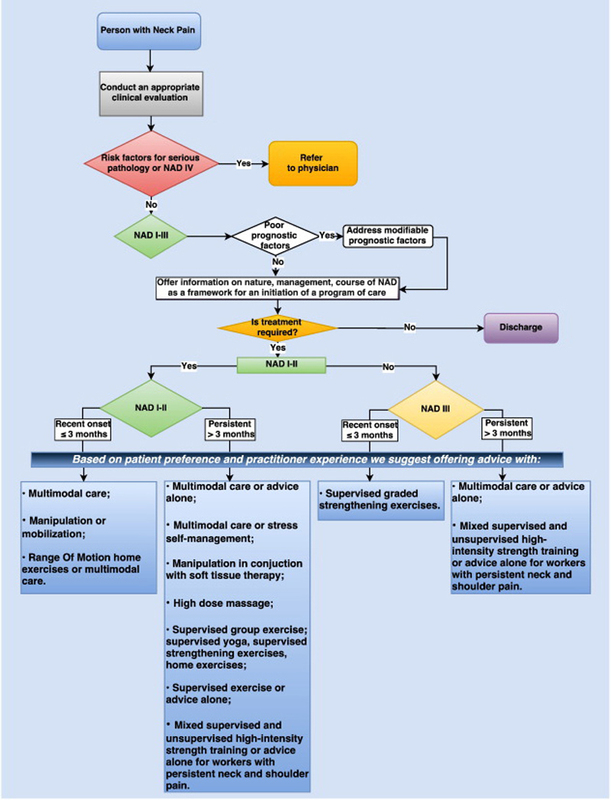 In this guideline, multimodal care refers to treatment involving at least 2 distinct therapeutic methods, provided by 1 or more health care disciplines. Manual therapy (including spinal manipulation), medication, and home exercise with advice are commonly used multimodal treatments for recent-onset and persistent neck pain. [21, 22] Thus, there is a need to determine which treatments or combinations of treatments are more effective for managing NAD and WAD. The Ontario Protocol for Traffic Injury Management (OPTIMa) Collaboration  recently updated the systematic reviews from the Bone and Joint Decade 2000–2010 Task Force on Neck Pain and Its Associated Disorders (Neck Pain Task Force). Consequently, it was deemed timely to update the recommendations of 2 chiropractic guidelines on NAD (2014)  and WAD (2010)  produced by the Canadian Chiropractic Association and the Canadian Federation of Chiropractic Regulatory and Educational Accrediting Boards (the “Federation”) into a single guideline. 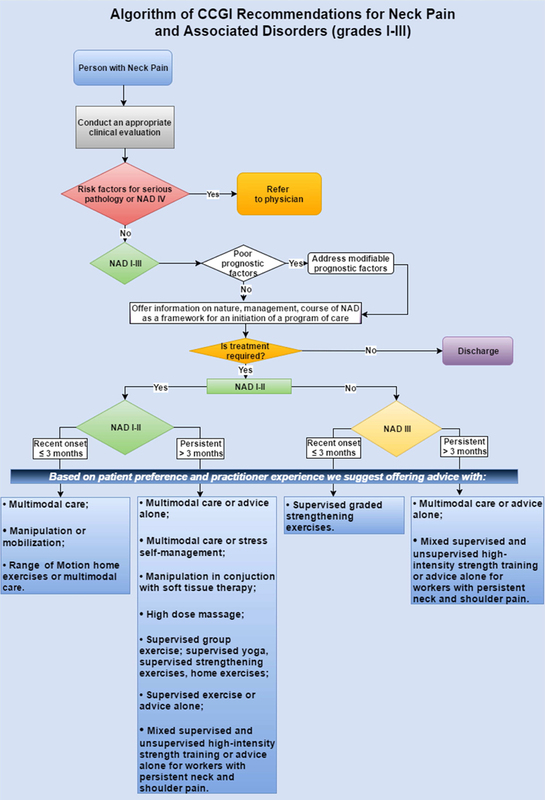 The aim of this clinical practice guideline (CPG) was to synthesize and disseminate the best available evidence on the management of adults and elderly patients with recent onset (0-3 months) and persistent (>3 months) neck pain and its associated disorders, with the goal of improving clinical decision making and the delivery of care for patients with NAD and WAD grades I to III. OPTIMa published a closely related guideline in the European Spine Journal. Although we reached similar results, OPTIMa developed recommendations using the modified Ontario Health Technology Advisory Committee (OHTAC) framework. In contrast, our guideline used the Grading of Recommendations Assessment, Development, and Evaluation (GRADE) approach. GRADE provides a common, sensible, and transparent approach to grading quality (or certainty) of evidence and strength of recommendations (http://www.gradeworkinggroup.org). GRADE was the highest scoring instrument among 60 evidence grading systems  and has been determined to be reproducible among trained raters. GRADE is now considered a standard in guideline development and has been adopted by many international guideline organizations and journals. 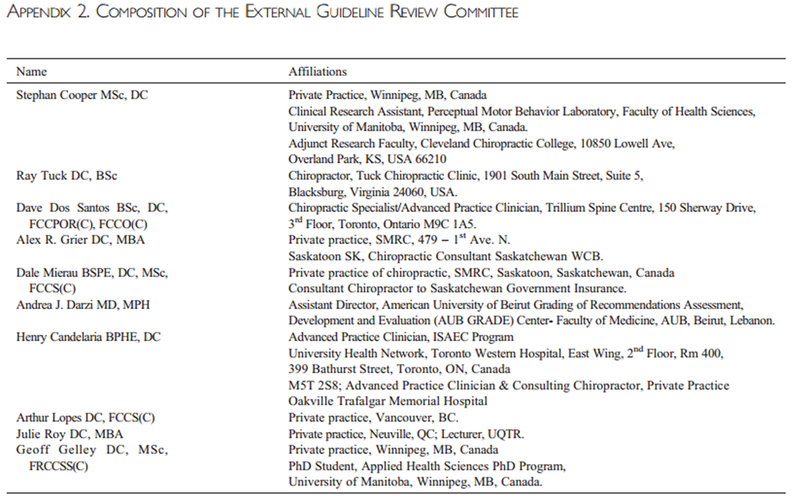 The Canadian Chiropractic Guideline Initiative (CCGI) guideline panel considered available high-quality systematic reviews, updated the search of the peer-reviewed published reports up to December 2015, and then used the GRADE approach to formulate recommendations for the management of neck pain and associated disorders. To inform its work, the CCGI considered recent advances in methods to conduct knowledge synthesis,  derive evidence-based recommendations, [31, 33] adapt high-quality guidelines,  and develop  and increase the uptake of CPGs. [36, 37] An overview of CCGI structure and methods is provided in Appendix 1. The CCGI project lead (A.B.) appointed 2 co-chairs (J.O. and G.S.) for the guideline development group and nominated the project executive committee and the remaining guideline panelists. J.O. served as the lead methodologist on the guideline panel. G.S. helped ensure geographic representation of the panel and advised on specific duties of panel members, time commitment, and decision-making process for reaching consensus (development of key questions and of recommendations). To ensure a broad representation, the guideline panel included clinicians (P.D., J.W. ), clinician researchers (F.A., M.D., C.H., S.P., I.P., J.S.) methodologists (J.O., A.B., M.S., J.H. ), a professional leader/decision maker (G.S. ), and 1 patient advocate (B.H.) to ensure that patient values and preferences were considered. One observer (J.R.) monitored the 3 face-to-face meetings of the guideline panel held in Toronto (June and September 2015 and April 2016). All CCGI members, including guideline panelists and peer reviewers, were required to disclose any potential conflict of interest by topic before participation and during the guideline development process. There was no self-declaration of conflicts of interest among the panel or the reviewers. Six topic areas (exercise, multimodal care, education, work disability, manual therapy, passive modalities) on the conservative management of NAD and WAD grades I to III were covered in 5 recent systematic reviews by the OPTIMa Collaboration, [38–42] among a total of 40 reviews on the management of musculoskeletal disorders. The panel met over 2 days in June 2015 to brainstorm about potential key questions. J.O. extracted data from scientifically admissible studies into evidence tables. A second reviewer (A.B.) independently checked the extracted data. We performed a qualitative synthesis of findings and stratified results based on the type and duration of the disorder (ie, recent [symptoms lasting <3 months] vs persistent [symptoms lasting >3 months]). and assessed the quality of the body of evidence for our outcomes of interest by applying the GRADE approach. We used the evidence profiles to summarize the evidence. The quality of evidence rating (high, moderate, low, or very low) reflects our confidence in the estimate of the effect to support a recommendation and considers the strengths and limitations of the body of evidence stemming from risk of bias, imprecision, inconsistency, indirectness of results, and publication bias. Assessment of quality of evidence was carried out in the context of its relevance to the primary care setting. Second, the results from relevant studies were used to formulate a recommendation where appropriate. A treatment determined to be effective (with statistically significant differences between baseline and follow-up scores and clinical significance based on the MCID applied in the study) was recommended by our panel. If a study found 2 or more treatments to be equally effective based on our threshold, then the panel recommended all equivalently effective treatments. A synthesis of our judgments about the domains determined the direction (ie, for or against a management approach) and the strength of recommendations (the extent to which one can be confident that the desirable consequences of an intervention outweigh the undesirable consequences). A specific format was followed to formulate recommendations using patient description and the treatment comparator. Remarks were added for clarification if needed. If the desirable and undesirable consequences were judged to be evenly balanced and the evidence was not compelling, the panel decided not to write any recommendation. A modified Delphi technique was used at an in-person meeting to achieve consensus on each recommendation. Using an online tool (www.polleverywhere.com), panelists voted their level of agreement with each recommendation (including quality of evidence and strength of recommendation) based on a 3-point scale (yes, no, neutral). Before voting, panelists were encouraged to discuss and provide feedback on each recommendation in terms of suggested wording edits or general remarks. To achieve consensus and be included in the final manuscript, each recommendation had to have at least 80% agreement with a response rate of at least 75% of eligible panel members. All recommendations achieved consensus in the first round. A 10-member external committee composed of stakeholders, end-users, and researchers from Canada, the United States, and Lebanon (Appendix 2) independently reviewed the draft manuscript, recommendations, and supporting evidence. The AGREE II instrument was used to assess the methodological quality of the guideline. Feedback received was collected and considered in a revised draft for a second round of review. Chairs of the guideline panel provided a detailed response to reviewers’ comments. For a glossary of terms, please see Appendix 3. Our updated search yielded 7,784 articles. We removed 1,411 duplicates and screened 6,373 articles for eligibility (Figures 1–5). After screening, 6,321 articles did not meet our selection criteria (phase 1), leaving 52 articles for full-text review (phase 2) and critical appraisal (studies on the topic of multimodal care (n = 12), structured patient education (n = 3), exercise (n = 8), work disability interventions (n = 13), manual therapy (n = 4), soft tissues (n = 2), and passive modalities (n = 6). Of the 52 RCTs, 4 scientifically admissible studies were included in our synthesis. The remaining articles failed to address the key question (n = 1); selected population (n = 2), outcomes (n = 13), or intervention (n = 11); had no between estimates (n = 19); or were duplicates (n = 1) or a secondary analysis of an included study (n = 1) (Appendix 5). (See pages 534–543) and Appendix 6, respectively. One RCT by Leaver et al. evaluated the effectiveness of neck manipulation or neck mobilization delivered by physiotherapists, chiropractors, or osteopaths for recent-onset grades I to II neck pain (≥2 NRS). All patients received advice, reassurance, or a continued exercise program as indicated for 4 treatments over 2 weeks unless recovery was achieved or a serious adverse event occurred. There was no statistically significant difference in Kaplan-Meier recovery curves between groups for recovery from neck pain and recovery of normal activity, and no statistically significant differences between groups for pain, disability, or other outcomes (function, global perceived effect, or health-related quality of life) at any follow-up point (Table 3). One other RCT by Dunning et al. evaluated the effectiveness of a single high-velocity, low-amplitude (thrust) manipulation (n = 56) directed to the upper cervical spine (C1–C2) and upper thoracic spine (T1–T2) compared with a (nonthrust) mobilization (n = 51) directed to the same anatomical regions for 30 seconds for patients with neck pain. Findings indicated a greater reduction in pain (NPRS) and disability (NDI) in the thrust manipulation group compared with the mobilization at 48 hours. No serious adverse events were reported. Minor adverse events were not collected. This study did not inform our recommendation because (1) patient complaints were not recent onset (mean duration >337 days in both groups), and (2) outcomes were measured at 48 hours only. The Guideline Development Group (GDG) considered this an important study limitation because one cannot assume these benefits would have carried on for a longer period. The panel acknowledged, however, that some patients may value obtaining fast pain relief even if temporary. Nagrale et al. reported non–clinically significant differences for neck pain and disability outcomes at 4 weeks. This study suggested that a soft tissue therapy intervention to the upper trapezius, combining ischemic compression, strain-counterstrain, and muscle energy technique, provides similar clinical benefit compared with muscle energy technique alone. Participants were required to have neck pain of less than 3 months’ duration. McReynolds et al. presented short-term outcomes of pain intensity and concluded that sessions of multimodal care (manipulation, soft tissue techniques) provided equivalent outcomes to an intramuscular injection of ketorolac. However, the follow-up time of 1 hour is generally atypical and the dosing was determined to be incomplete for multimodal care as reported. Furthermore, the study was limited to an emergency setting only. The panel determined low certainty in the clinical evidence, with small desirable and undesirable effects. There is relatively low risk for multimodal care, considering the reported outcomes were equal. From a clinician standpoint, resources required are small assuming no additional staff are needed. However, one practitioner gave most multimodal therapies. Expenses may vary depending on the definition of multimodal care. This option should not create health inequities, except for those who cannot access clinicians or choose to pay out of pocket, and would be feasible to implement. Professional associations would generally support the option, yet extended multimodal therapies can incur additional costs, which can be unfavorable to both payors and patients. Overall, the balance between the desirable and undesirable consequences is uncertain and more research is needed in this area before any recommendation can be made. One RCT by Kuijper et al. evaluated the effectiveness of supervised strengthening exercises compared with advice to stay active for recent-onset grade III neck pain. This RCT reported that strengthening exercises (n = 70) were more effective than advice to stay active (n = 66). Trial participants were followed at 3 weeks, 6 weeks, and 6 months. 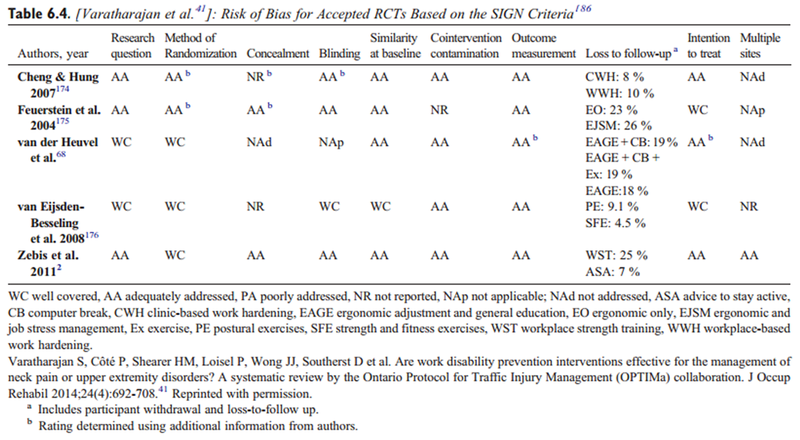 Based on panel consensus, outcomes determined to be important in the assessment of effectiveness in this RCT included neck and arm pain (VAS) and disability (NDI). These outcomes were both statistically and clinically significant (Table 5). In this RCT, the strengthening exercise program was delivered by physiotherapists 2 times per week for 6 weeks. It included supervised graded strengthening exercises for the shoulder and daily home exercises to strengthen the superficial and deep neck muscles (mobility, stability, and muscle strengthening). Participants in the comparison group were advised to continue daily activities. Both groups were allowed to use painkillers. See Key Question 6 for a recommendation on cervical collar. Remark: *Supervised graded strengthening exercises consisted of strengthening and stability exercises twice a week for 6 weeks with daily home exercises (which included mobility, stability, and muscle strengthening). †Advice alone consisted of maintaining activity of daily living without specific treatment. One RCT by Kuijper et al. randomly assigned 205 patients with recent-onset neck cervical radiculopathy (NAD grade III) to 1 of 3 groups (1): Rest and semi-hard cervical collar for 3 weeks, then weaned off during weeks 3–6 (2); physiotherapy (mobilizing and stabilizing the cervical spine, standardized graded neck strengthening exercises twice per week for 6 weeks, and education to do daily home exercises); or (3) a control group (wait and see with advice to continue daily activities). All patients received written and oral reassurance about the usually benign course of the symptoms and were allowed painkillers. One RCT by Konstantinovic et al. evaluated the effectiveness of low-level laser therapy (LLLT) delivered 5 times per week for 3 weeks compared with placebo (inactive laser treatment) for recent-onset grade III neck pain. LLLT leads to statistically but not clinically significant improvements in neck pain and disability at 3 weeks compared with placebo. Transitional worsening in pain (20%) and persistent nausea (3.33%) were observed in the LLLT group, whereas no adverse events were reported in the placebo group. Key Questions 8 and 9: Should work disability prevention interventions vs fitness and strengthening exercise program be used for recent-onset nonspecific work-related upper limb disorders? Should work disability prevention interventions be used for recent-onset work-related neck and upper limb complaints? In reviewing the evidence on work disability prevention interventions,  the GDG concluded that the balance between desirable and undesirable consequences was “closely balanced or uncertain.” As a result, the guideline panel was unable to formulate recommendations for these key questions, yet future research is very likely to either positively or negatively support the various types of work disability prevention interventions. Although some benefits were reported favoring computer-prompted and instructed exercise interventions,  the incremental self-reported improvement was insufficient to formulate a recommendation considering (1) a follow-up period of 8 weeks in reviewed studies is too short to estimate long-term sustained benefits; and (2) the potential costs related to programming and worker instruction may be significant. Overall, it appears that adding computer-prompted exercises (with workplace breaks), or workplace breaks alone, to a program of ergonomic modification and education improves self-perceived recovery and symptomatic benefits in computer workers with neck and upper back complaints. However, it is unclear whether the addition of computer-prompted exercises to the various established workplace interventions alters perceived or objective health outcomes. Future research may identify added benefits in order for stakeholders to consider the extra cost as being surmountable. A 2-part RCT by Lamb et al. evaluated the effectiveness of oral advice compared with written material for improving pain (self-rated neck pain) and disability (NDI) in patients with recent-onset grades I to III WAD. Lamb et al. included a total of 3,851 participants with a history of WAD grades I to III of less than 6 weeks’ duration who sought treatment at an emergency department. A total of 2,253 participants received active management advice in the emergency department incorporating oral advice and the Whiplash Book, which included reassurance, exercises, encouragement to return to normal activities, and advice against using a collar; 1,598 participants received usual care advice, including verbal and written advice along with anti-inflammatory medication, physiotherapy, and analgesics. No between-group difference was observed in self-rated neck pain and disability at 12-month follow-up and no difference in workdays lost was observed at 4-month follow-up (Table 6). exercises (shoulder complex mobilization and range of motion [ROM]; cervical and scapular stability and proprioception), and cervical and thoracic spine Maitland mobilization and manipulation; a total of 299 received single-session reinforcement advice from a physiotherapist during their previous visit to emergency department. Lamb et al. reported outcomes at 4 months for self-rated disability, identifying no clinically significant differences between groups. The study suggested that oral advice and an educational pamphlet provide similar benefits. Key Question 12: Should supervised exercise (ie, qigong exercise) vs no treatment (wait listing) be used for persistent (>3 months) grades I to II NAD? 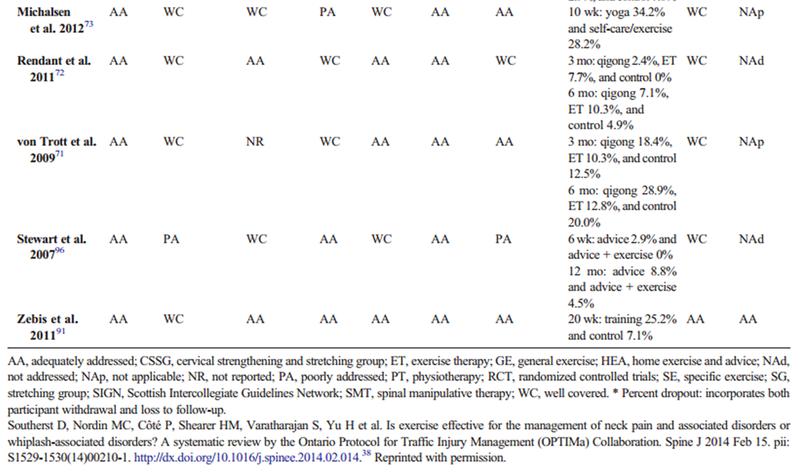 Two RCTs (Table 7) evaluated the effectiveness of supervised qigong compared with supervised exercise therapy and no treatment on neck pain (101-point VAS), disability (NDI), and Neck Pain and Disability Scale in a total of 240 patients with chronic neck pain (>6 months). [71, 72] Rendant et al. reported that, in adults with chronic neck pain, supervised qigong is more effective than no treatment and as effective as exercise therapy in reducing neck pain and disability at 3 and 6 months. Conclusions regarding the effectiveness of these 2 interventions compared with no treatment in patients aged older than 55 years cannot be drawn from the included studies. In their study of these interventions for neck pain in elderly patients, von Trott et al. observed a reduction in pain and disability in both intervention groups at 3 and 6 months (although not statistically significant). The quality of the evidence was downgraded to low based on the SIGN criteria (concealment method not reported). In the von Trott et al. study, the interventions consisted of two 45-minute sessions per week for 3 months (a total of 24 sessions),  whereas in the Rendant et al. study, interventions consisted of 12 treatments in the first 3 months and 6 treatments in the following 3 months (total of 18 sessions). Exercise therapy in both studies included repeated active cervical rotations and strengthening and flexibility exercises in the form of Dantian qigong  or Neiyanggong qigong. Similar minor transient side effects were reported in both the intervention and comparison groups. Remark: Patients received 18 to 24 group sessions during a period of 4 to 6 months. Patients considered had a rating of 40/100 on a pain scale (VAS). The intervention group reached suggested MCID level of 10% difference for pain and functional outcomes. *Exercises included qigong or ROM, flexibility, and strengthening exercises. No evidence of significant effect in the elderly population. Key Question 13: Should supervised yoga vs education be used for persistent (>3 months) grades I to II NAD? One RCT by Jeitler et al. 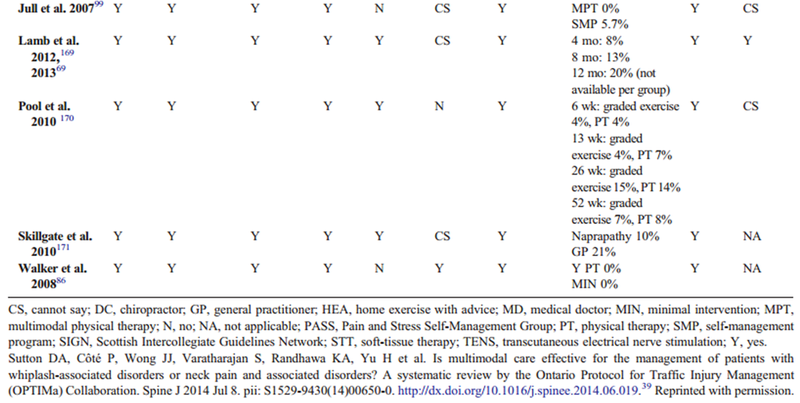 evaluated the effectiveness of Jyoti meditation compared with exercise on neck pain (VAS). The results showed that Jyoti meditation (sitting motionless, repeating a mantra, and visual concentration while keeping the eyes closed) is more effective than exercise (established and previously used self-care manual for specific exercise and education for chronic neck pain). Because Jyoti meditation only includes 1 of the 3 components of yoga (ie, meditation), Jeitler et al. was not considered in developing the following recommendation. Key Question 14: Should supervised strengthening exercises vs home ROM or stretching exercises be used for persistent (>3 months) grades I to II NAD? Three RCTs evaluated the effectiveness of supervised strengthening exercises compared with home exercises for grades I to II neck pain and disability. Two RCTs (Hakkinen et al. and Salo et al. ) reported no significant between group differences at 1 year for primary or secondary outcomes. One RCT (N = 170) reported that supervised strengthening exercises were more effective than home ROM exercises. Two smaller RCTs (N = 107) found that both treatments are equally effective. [75, 76] All 3 trials had a follow-up of 1 year. Based on our panel’s consensus, outcomes determined to be important in the assessment of effectiveness for these RCTs included pain (NRS) and disability (NDI). A fourth RCT by Maiers et al. assessed the effectiveness of supervised rehabilitative exercises in combination with and compared with home exercises alone for persistent neck pain in individuals aged 65 years or older. All participants in the study received 12 weeks of care. One group received 20 supervised 1-hour exercise sessions in addition to home exercises. Home exercises consisted of four 45- to 60-minute sessions to improve flexibility, balance, and coordination and enhance trunk strength and endurance. Participants also received instructions on pain management, practical demonstrations of body mechanics (lifting, pushing, pulling, and rising from a lying position), and massaging to stay active. Results favored supervised rehabilitative exercises combined with home exercises over home exercise for pain (NRS) and disability (NDI) at 12 weeks. However, between-group differences did not reach statistical significance. Remark: For reduction in pain, supervised strengthening exercises, provided along with ROM exercises and advice, were evaluated at 12 weeks within 20 sessions. Home exercises include stretching or self-mobilization. Key Question 15: Should strengthening exercises vs general strengthening exercises be used for persistent (>3 months) grades I to II NAD? Griffiths et al. presented non–clinically significant outcomes for neck pain and disability among patients with persistent neck pain and concluded there is no added benefit of incorporating specific isometric exercise to a general exercise program. Dosages were up to 4 sessions per 6-week period, with advice for 5 to 10 times at home. The general exercise program consisted of postural exercise, active ROM, 5 to 10 times daily with reinforcement. Key Question 16: Should combined supervised strengthening, ROM, and flexibility exercises vs no treatment (wait listing) be used for persistent (>3 months) grades I to II NAD? von Trott et al. and Rendant et al. presented significant outcomes for reduction in neck pain and disability that favor combined strengthening, ROM, and flexibility exercises. Both studies address different populations and lead to similar outcomes (von Trott et al. addressed elderly populations). The panel determined there was moderate certainty in the clinical evidence, with large desirable and small undesirable anticipated effects. Yet there may be differences in adverse events for strengthening vs ROM and flexibility exercises, along with the challenges of such adverse events being self-reported. For example, strengthening exercises likely coincide with short-term pain after the intervention. Further, significant space may be required for exercises, which may incur large costs that need to be considered up front. As a result, there is uncertainty about the feasibility to implement and whether this could widely affect health inequalities. However, the option would be acceptable to stakeholders. Overall, the desirable consequences would probably outweigh the undesirable consequences. The panel determined this topic and its evidence has substantial overlap with Key Question 12 (qigong was considered exercise). Therefore, 1 recommendation was made, addressing both topics. Key Question 17: Should multimodal care vs self-management be used for persistent (>3 months) grades I-II NAD? Remark: *Individualized multimodal care may include manual therapy (manipulation, mobilization, massage, traction), acupuncture, heat, transcutaneous electrical nerve stimulation, exercise, and/or ultrasound. †Stress self-management may include relaxation, balance and body awareness exercises, pain and stress self-management lectures, and discussion. The multimodal care group received an average of 7 (range 4–8) sessions, compared with 11 (range 1–52) sessions for the stress self-management group over 20 weeks. Key Question 18: Should structured patient education vs massage therapy be used for persistent (>3 months) NAD? Sherman et al. reported non–clinically significant outcomes at 4 weeks for disability. This study suggests a mailed self-care book and a course in massage therapy provide similar clinical benefits for patients with persistent neck pain. The panel determined the overall certainty of the evidence was low, with relatively large anticipated effects and no serious adverse events noted from intervention (some headaches possibly). There is uncertainty in the costs required, including necessary staff, equipment, and materials. Yet this option is feasible to implement in most settings and has strong implications for reducing health inequities. As a preventive strategy, the intervention is acceptable to stakeholders, including the chiropractic practitioners, patients, and policymakers. The panel was uncertain about the balance between the desirable and undesirable consequences. Additional high-quality studies are needed in this area before any recommendation can be made. Evans et al. compared spinal manipulation in addition to 20 weeks of supervised exercise therapy (20 sessions) to supervised exercise therapy alone in adults with persistent grades I to II neck pain, whereas Maiers et al. compared spinal manipulation in addition to home exercises (20 sessions maximum) to home exercise alone in seniors with persistent grades I to II neck pain. Pain and disability outcomes at 12 and 52 weeks did not reach statistical significance in between-group differences, except for pain level at 12 weeks in the Maiers study. A third RCT by Lin et al. allocated 63 persistent neck pain patients (NAD I–II) to the experimental group (n = 33) treated with cervical spine manipulation and traditional Chinese massage (TCM) compared with TCM alone (n = 30) over 3 weeks. 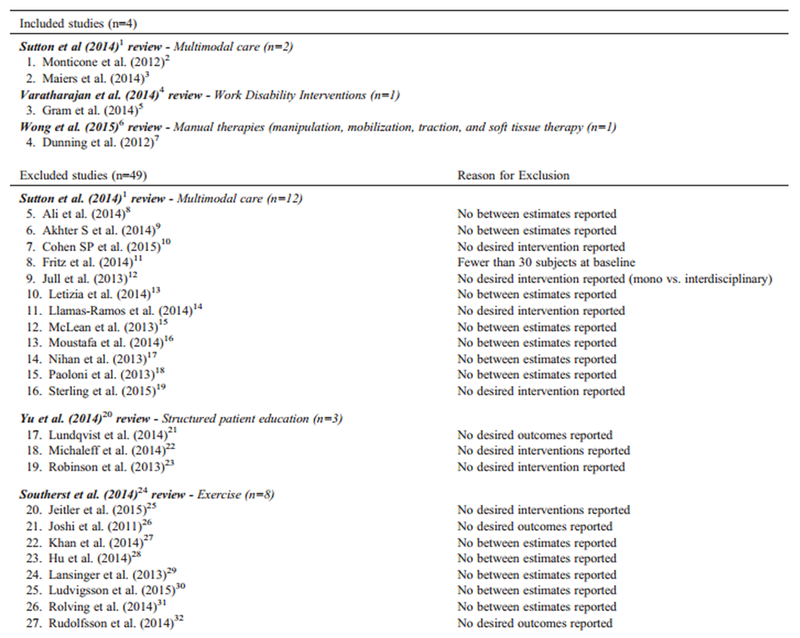 Results favored cervical manipulation with TCM over TCM alone for pain (NPS) and disability (Northwick Park Neck Disability Questionnaire) at 3 months (Table 11). Key Question 20: Should massage vs no treatment (wait listing) be used for persistent (>3 months) grades I to II NAD? Sherman et al. and Lauche et al. reported non–clinically significant differences in outcomes for disability at 4 and 12 weeks, respectively. Sherman et al. suggested Swedish and/or clinical massage with verbal self-care advice provides similar clinical benefit to a self-care book for disability outcomes. Lauche et al. suggested cupping massage and progressive muscle relaxation lead to similar changes in disability. Sherman et al. reported outcomes for neck pain and disability at 4 weeks and suggested that higher doses of massage provide superior clinical benefit (Table 12). The panel determined low certainty in the evidence, with small desirable and undesirable effects. Additional costs may be needed to get clinical benefit. Sherman et al. suggested a minimum of 14 hours of staff time needed. Because of the costs associated with high-dose massage, it may not be entirely acceptable to patients or payors. However, this option is feasible and relatively easy to implement in educated and affluent populations similar to subjects primarily studied. Overall, the panel decided the desired consequences probably outweigh the undesirable consequences and suggest offering this option. Key Question 21: Should LLLT be used for persistent (>3 months) grades I to II NAD? After full-text screening and review, no studies addressing between-group differences among outcomes of pain or disability were included to inform this key question. The lack of evidence and uncertainty in the overall balance between desirable and undesirable consequences led the panel to decide not to write a recommendation for this topic at this time. More high-quality studies are needed in this area before certainty in judgments or recommendations can be made. Key Question 22: Should transcutaneous electrical nerve stimulation vs multimodal soft tissue therapy program be used for persistent (>3 months) grades I to II NAD? After full-text screening and review, no studies addressing between-group differences among outcomes of pain or disability were included to inform this key question. The lack of evidence and uncertainty in the overall balance between desirable and undesirable consequences led the panel to decide not to write a recommendation for this topic at this time. More high quality studies are needed in this area before certainty in judgments or recommendations can be made. 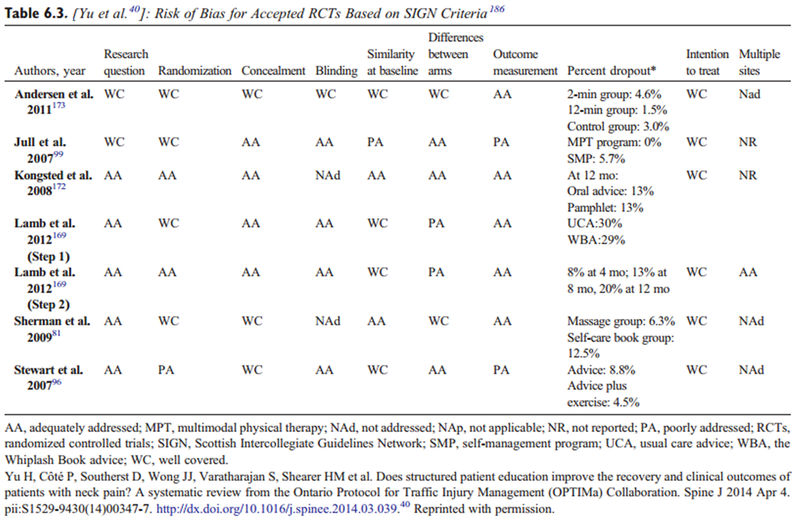 One RCT by Walker et al. evaluated the effectiveness of multimodal care for neck pain with or without unilateral upper extremity symptoms (grades I–III). They compared treatment effects of combined multimodal care and home exercises (n = 47) to multimodal minimal intervention (n = 47). Both intervention groups received on average of 2 sessions per week for 3 weeks. No interventions were rendered after 6 weeks. Baseline self-reported questionnaires included neck and arm pain (VAS) and disability (NDI). All measures were repeated at 3, 6, and 52 weeks. Patients in the multimodal care and home exercise group had significantly greater reduction in short-term neck pain and in short-term and long-term disability compared with the multimodal minimal intervention group (Table 13). In an RCT, Monticone et al. evaluated the effectiveness of multimodal care for persistent neck pain. They compared treatment effect of multimodal care alone (n = 40) to multimodal care in conjunction with cognitive behavioral treatment (n = 40). Both groups had a reduction in pain (NRS) and disability (NPDS), but there were no clinically significant differences between the groups at 52 weeks. The addition of a cognitive behavioral treatment did not provide greater outcomes than multimodal care alone. Remark: *Multimodal care and exercises may consist of thrust/nonthrust joint manipulation, muscle energy, stretching, and home exercises (cervical retraction, deep neck flexor strengthening, cervical rotation ROM). †Multimodal minimal intervention may consist of postural advice, encouragement to maintain neck motion and daily activities, cervical rotation ROM exercise, instructions to continue prescribed medication, and therapeutic pulsed (10%) ultrasound at 0.1 W/cm2 for 10 minutes applied to the neck and cervical ROM exercises. One large cluster RCT (n = 537) by Zebis et al. evaluated the effectiveness of strength training in the workplace compared with receiving advice to stay physically active on nonspecific neck and shoulder pain intensity. The findings indicated a similar reduction in neck and shoulder pain intensity at 20 weeks for the exercise program compared with advice (Table 14). The intervention consisted of 3 sessions per week, each lasting 20 minutes, for up to 20 weeks (total of 60 sessions). The workplace exercise program consisted of high-intensity strength training relying on principles of progressive overload and involved local neck and shoulder muscles strengthening with 4 different dumbbell exercises and 1 exercise for the wrist extensor muscles. More than 15% of workers assigned to the workplace exercise group reported minor and transient complaints. The comparison group reported no adverse events. A subgroup analysis  of the primary Zebis et al. study  included 131 women with a baseline neck pain rating of at least 30 mm VAS from the 537 male and female participants. Results favored specific resistance training over advice to stay active for pain (VAS) at 4 weeks. This study was not included because findings were already considered in the primary study. Key Question 26: Should structured patient education vs exercise programs be used for persistent (>3 months) NAD in workers? Andersen et al. reported non–clinically significant outcomes at 10 weeks for neck and shoulder pain, suggesting weekly e-mailed information on general health behaviors and shoulder abduction exercise programs provide similar clinical benefit. Yet implementation of high-intensity strength training exercises in industrial workplaces (implementation of exercise into day-to-day life and to increase active leisure time) is generally supported. [94, 95] In another RCT, pain reduction was significantly greater than in the group receiving advice alone. Findings from Zebis et al. are also included in the exercise intervention section of this guideline. Key Questions 27–29: Should work-based hardening vs clinic-based hardening be used for persistent (>3 months) work-related rotator cuff tendinitis? Should work disability prevention interventions be used for persistent neck and shoulder pain? Should work disability prevention interventions be used for persistent (>3 months) upper extremity symptoms? In reviewing the evidence on work disability prevention interventions,  the GDG concluded that the balance between desirable and undesirable consequences was “closely balanced or uncertain” for Key Questions 27–29. As a result, the guideline panel was unable to formulate recommendations for these key questions, yet future research is very likely to either positively or negatively support the various types of work disability prevention interventions. Key Question 30: Should supervised general exercise and advice vs advice alone be used for persistent (>3 months) grades I to II WAD? A pragmatic trial assigned 172 patients with persistent WAD grades I to II to receive a comprehensive 12-week exercise program (20 sessions including manual therapy technique the first week [no manipulation] and cognitive behavioral therapy delivered by physiotherapists) or advice (1 session and telephone support). The comprehensive exercise program was not more effective than advice alone for pain reduction or disability, although findings favored a comprehensive physiotherapy exercise program over advice. The panel determined low certainty in the evidence, with small desirable and undesirable effects and no serious adverse events (5 patients who received the comprehensive exercise program and 4 who received advice had minor transient adverse events). Overall, the panel decided the balance between the desirable and undesirable consequences such as costs was uncertain, and more evidence is needed before a recommendation can be made. In a 20-week cluster RCT, Gram et al. (2014)  randomly assigned 351 office workers to 2 training groups receiving the same total amount of planned exercises 3 times per week, with 1 group supervised throughout the intervention period and the other receiving minimal supervision only initially, and a reference group (without exercise). Although results indicated that supervised training at the workplace reduced neck pain, results were not clinically significant and both training groups improved independently of the extent of supervision. The panel decided not to consider this study in formulating a recommendation because exercise was not directly compared with advice and an important loss to follow-up occurred across groups. Although supervised exercise appears to be beneficial, costs can be high. This could possibly be mitigated, however, by offering group treatment, which may increase compliance and accountability with a supervised group. Key Question 31: Should multimodal care vs self-management program be used for persistent (>3 months) grade II WAD? Jull et al. reported no clinically or statistically significant outcomes for pain and disability at 10 weeks. 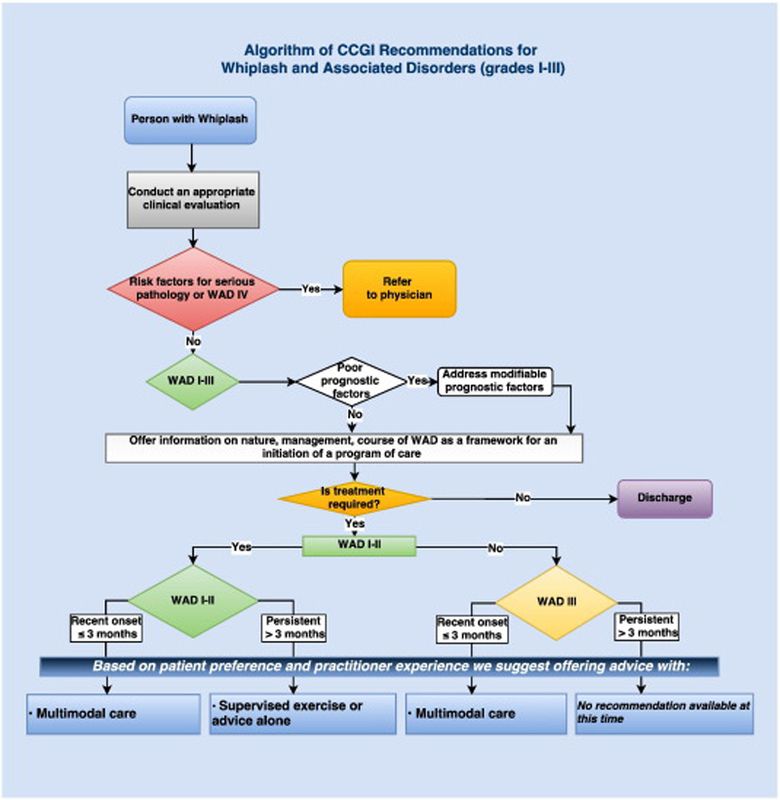 They suggested that multimodal care (exercises, mobilization, education, and ergonomic advice) provided similar outcomes to a self-management program based on an educational booklet (mechanism of whiplash, reassurance of recovery, stay active, ergonomic advice, exercise). Care did not include high-velocity manipulation. Although this study is specific to physiotherapists, it is well within the scope of chiropractors (manual therapists). One other RCT by Jull et al. evaluated the effectiveness of multidisciplinary individualized treatments for patients with acute whiplash (<4 weeks postinjury). Patients randomly assigned to pragmatic intervention (n = 49) could receive medication including opioid analgesia, multimodal physiotherapy, and psychology for post-traumatic stress over 10 weeks. No significant differences in frequency of recovery (NDI ≤ 8%) between pragmatic and usual care groups was found at 6 or 12 months. There was no improvement in current nonrecovery rates at 6 months (63.6%, pragmatic care; 48.8%, usual care), indicating no advantage of the early multiprofessional intervention. The panel determined low certainty in the clinical evidence, with small desirable and undesirable effects reported. Yet there were relatively small costs and resources required to implement the intervention. Electronic dissemination of the educational component of multimodal care may reduce health inequities. The option may be acceptable to clinicians (assuming collaborative care approaches), policymakers, and patients and is likely feasible to implement in usual care settings. Overall, the balance between the desirable and undesirable consequences is uncertain, and no recommendation is given at this time. Further studies need to be conducted in this area and should involve multimodal care including high-velocity procedures or manipulation. Key Question 32: Should structured patient education vs advice be used for persistent (>3 months) WAD? Stewart et al. (2007)  reported non–clinically significant between differences for pain and disability outcomes at 6 weeks. This study suggested that adding a physiotherapy-based graded exercise program to a structured advice intervention provided similar clinical benefit as structured education alone. The panel determined low certainty of the evidence, with low desirable and undesirable anticipated effects. The main complaints were muscle pain, knee pain, and spinal pain with mild headaches. The small resources required for the intervention may reduce health inequities, and the option is acceptable to stakeholders and feasible to implement in most settings. This evidence-based guideline establishes the best practice for the management of NAD and WAD resulting from or aggravated by a motor vehicle collision and updates 2 previous guidelines on similar topics. [24, 25] This guideline covers recent-onset (0-3 months) and persistent (>3 months) NADs and WADs grades I to III. It does not cover the management of musculoskeletal thoracic spine or chest wall pain. The primary outcomes reported in the selected studies were neck pain intensity and disability. Although all recommendations included in this guideline are based on low risk of bias RCTs, the overall quality of evidence is generally low considering other factors considered by GRADE such as imprecision, and thus the strength of recommendations is weak at this time. (Table 16 see page 550). A recent systematic review and meta-analysis by Wiangkham (2015)  on the effectiveness of conservative management for acute WAD grade II included 15 RCTs, all assessed as high risk of bias (n = 1,676 participants), across 9 countries. Authors concluded that conservative interventions (noninvasive treatment), including active mobilization exercises, manual techniques, physical agents, multimodal therapy, behavioral approaches, and education, are generally effective for recent-onset WAD grade II to reduce pain in the medium and long term and to improve cervical ROM in the short term compared with standard or control intervention. Although findings from the Wiangkham review are generally in line with those from the systematic reviews we included in this guideline, [24, 25] the pooling of high risk of bias and of clinically heterogeneous trials seriously challenges the validity of this more recent review. First, the recommendations for the management of minor injuries of the neck were recently released by the Ministry of Finance of Ontario in collaboration with the OPTIMa Collaboration  and published as a separate guideline. 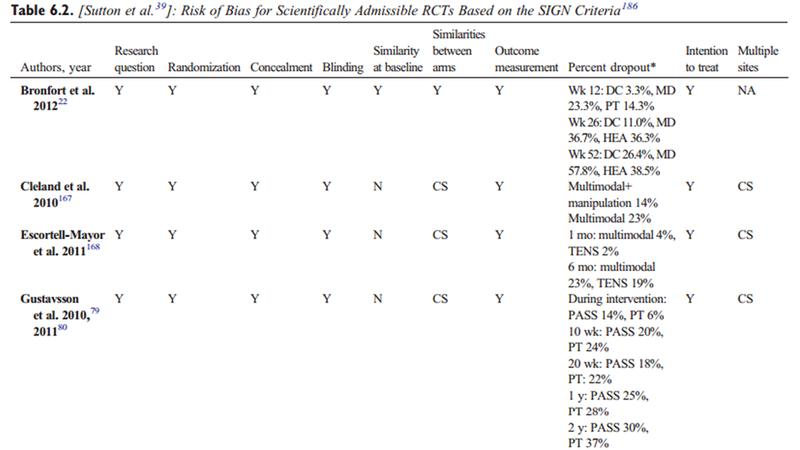 They considered the risks of bias of included RCTs using the SIGN criteria  and the guideline recommendations developed using the modified OHTAC framework,  based on 3 decision determinants (1): overall clinical benefit (evidence of effectiveness and safety) (2); value for money (evidence of cost-effectiveness where available); and (3) consistency with expected societal and ethical values. 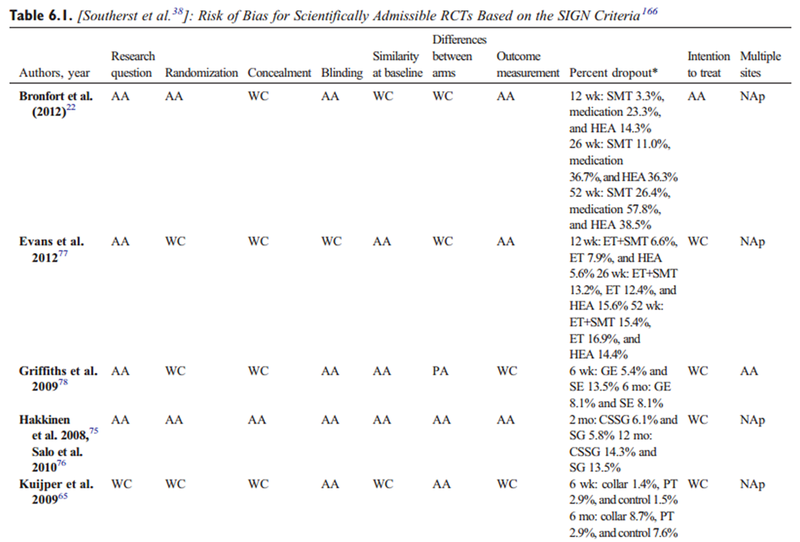 In the current guideline, we used the GRADE approach, which, in addition to considering risk of bias of included RCTs, takes into account 4 other factors (imprecision, inconsistency, indirectness, publication bias) to rate the confidence in effect estimates (quality of evidence) for each outcome. As a result of imprecision of estimates in several RCTs, the overall quality of admissible studies was deemed low. GRADE considers similar decision determinants as the modified OHTAC to develop recommendations when subsequently making an overall rating of confidence in effect estimates across all outcomes based on those outcomes considered critical to a particular recommendation. Accordingly, the guideline panel was asked to consider this low quality of evidence when judging the “desirable” consequences. When the benefits of important outcomes slightly outweighed undesirable effects of the intervention, a weak recommendation was made (ie, suggestions for care). This is likely to involve ensuring patients understand the implications of the choices they are making, possibly using a formal decision aid. However, if the judgment was “closely balanced or uncertain,” no recommendation could be made. Second, OPTIMa  recommended that interventions should only be provided in accordance with published evidence for effectiveness, including parameters of dosage, duration, and frequency, and within the most appropriate phase. The emphasis during the early phase (0–3 months) should be on education, advice, reassurance, activity, and encouragement. Health care professionals should be encouraged to consider watchful waiting and clinical monitoring as evidence-based therapeutic options during the acute phase. For injured persons requiring therapy, time-limited and evidence-based interventions should be implemented on a shared decision-making basis, an approach that equally applies to patients in the persistent phase (4–6 months). Despite using slightly different methods to derive recommendations, the 2 processes generally led to similar guidance. 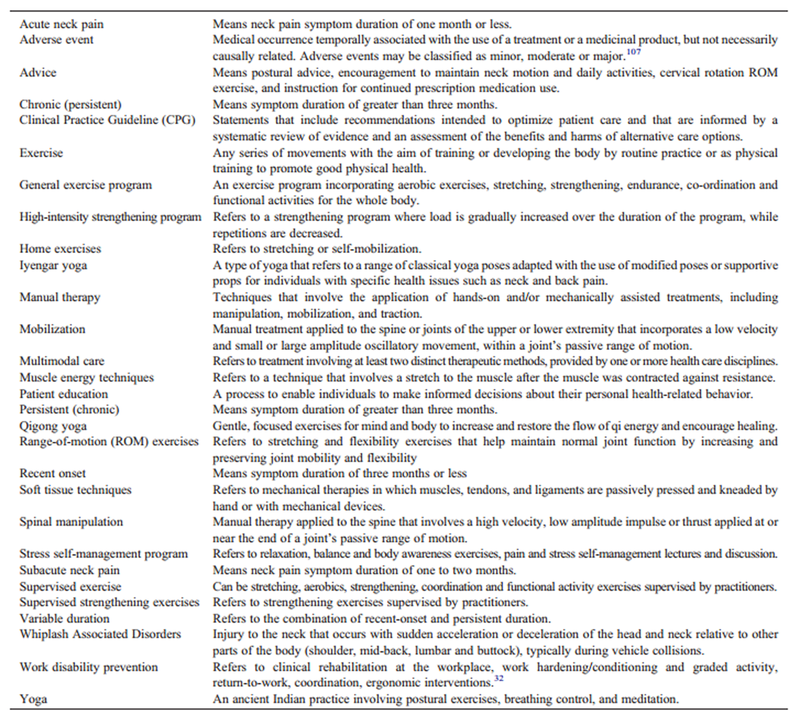 Similarly for persistent NAD, programs solely of clinic-based supervised high-dose strengthening exercises, strain-counterstrain or relaxation massage, relaxation therapy for pain or disability outcomes, transcutaneous electrical nerve stimulation (TENS), electric muscle stimulation, pulsed shortwave diathermy, heat (clinic based), electroacupuncture, and botulinum toxin injections are not recommended. A comparison of the recommendations with 2 previous chiropractic guidelines [24, 25] reveals that a multimodal approach including manual therapy, advice, and exercise remains the overall recommended strategy of choice for the treatment of neck pain. However, treatment modalities included in recommended multimodal care differed according to the quality of the evidence available at the time. The 2010 guideline on the management of WAD developed treatment recommendations based on low-quality evidence from 8 available RCTs and 3 cohort studies. Overall, recommendations for recent and persistent WAD are similar (multimodal care, and supervised exercise and multidisciplinary care, respectively). The 2014 guideline on neck pain  developed 11 treatment recommendations from 41 RCTs. The current guideline developed 13 recommendations from 26 low risk of bias RCTs. 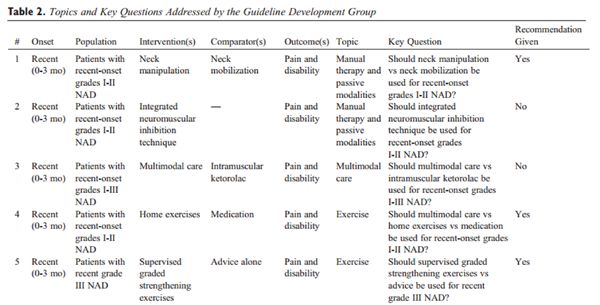 In line with the 2014 guideline  for recent-onset neck pain, the current recommendations suggest offering multimodal care including mobilization, advice, and exercises. The current guideline recommendations also suggest offering supervised graded strengthening and stability exercises. Similar to the 2014 guideline for persistent neck pain (grades I-II),  the current recommendations suggest offering multimodal care consisting of manual therapy (spinal manipulation therapy or mobilization) and exercises. Details on specific exercise modalities are now provided, including suggestions for supervised and unsupervised exercises, strength training, and supervised group exercises such as workplace exercise programs and supervised yoga. This guideline did not specifically review the evidence on adverse events from treatments. However, in the review by Wong et al. on manual therapy and passive modalities, 22 of the low risk of bias RCTs addressed the risk of harm from conservative care. Most adverse events were mild to moderate and transient (mostly increased stiffness and pain at the site of treatment, with a mean rate of about 30%). No serious neurovascular adverse events were reported. Another review of published RCTs and prospective cohort studies confirmed that around half of people treated with manual therapy can expect minor to moderate adverse events after treatment, but that the risk of major adverse events is small. The pooling of data from RCTs of manual therapy on the incidence of adverse events indicated that the relative risk of minor or moderate adverse events was similar for manual therapy and exercise treatments, and for sham/passive/control interventions. (5) reassess the patient at every visit to determine whether additional care is necessary, the condition is worsening, or the patient has recovered. People with musculoskeletal pain will often adopt an inactive lifestyle. Unfortunately, physical inactivity is associated with important adverse health effects, including increased risks of coronary heart disease, type 2 diabetes, and breast and colon cancers, and shorter life expectancy in general. The World Health Organization  provided clear guidance on physical activity for health for children, adults, and elders. In addition, recent research suggests that WAD patients with high levels of passive coping strategies have slower pain and disability recovery. Self-management support (SMS) strategies aimed at increasing physical activity and active coping strategies are key to effectively managing spinal pain and related comorbidities. [124, 125, 130–134] The CCGI developed a theory-based knowledge translation (KT) intervention targeting identified barriers to professional behavior change to increase the uptake of SMS strategies among Canadian chiropractors. Interviews of clinicians identified 9 theoretical domains as likely relevant (ie, factors perceived to influence the use of multimodal care to manage nonspecific neck pain). The intervention, comprising a webinar and a learning module on Brief Action Planning, is a highly structured SMS strategy that allows patient-centered goals  and is being pilot-tested among Canadian chiropractors (ongoing pilot trial). Care providers are encouraged to perform periodic clinical revaluations and to monitor patient progression of self-management strategies while discouraging dependence on passive treatment. Overall, the quality of the research on conservative management of NADs and WADs remains low, partly explaining that only weak recommendations could be formulated for clinical practice. Further, the reporting of RCTs remains suboptimal. Past recommendations for improving the quality of the research still apply. [24, 25] Future research should aim to clarify the role of spinal manipulation therapy alone or as part of multimodal care for the management of recent neck pain and have adequate frequency and length of follow-up. For instance, a large number of patient visits to the emergency departments each year are for acute neck and arm pain resulting from WADs. [14, 139] A small RCT suggested that cervical spine manipulation is a reasonable alternative to intramuscular NSAID for immediate pain relief in these patients. However, the small sample size, comparison of a single session of spinal manipulation to an NSAID injection, and a 1-day follow-up was not representative of clinical practice. Efforts to bridge the “research-practice gap” have led to a growing interest in KT. [145, 147] Knowledge translation is defined as the exchange, synthesis, and ethically sound application of knowledge to improve health and provide more effective health services. Knowledge translation aims to bridge the research-practice gap and improve patient outcomes by promoting the integration and exchange of research and evidence-based knowledge into clinical practice. The CCGI has established a network of opinion leaders across Canada (www.chiroguidelines.org). Based on successful efforts to implement a WAD guideline in Australia using opinion leaders among regulated physiotherapists, chiropractors, and osteopaths,  the CCGI is planning a series of implementation studies among Canadian chiropractors. We will also pilot within chiropractic practice-based research networks. Monitoring guideline use in chiropractic is challenging because the use of electronic health records to routinely collect clinical practice information is not common in Canada and those using electronic health records often collect different indicators. Nonetheless, the frequency of downloads (posting of the open access guideline on the CCGI website) and number of registering participants and completion of educational online material (webinar, video, and learning module) will be monitored monthly as proxy measures of guideline uptake. and associated disorders (grades I to III). Shortcomings for this guideline include the low quantity and quality of supporting evidence found during the searches. Most of the downgrading of evidence supporting the outcomes occurred because of imprecision. In addition, our updated search of the published reports included 2 databases (Medline and Cochrane Central Register of Controlled Trials) but was limited to the English published reports, which possibly excluded some relevant studies. This, however, is an unlikely source of bias.164, 165 Qualitative studies that explored the lived experience of patients were not included. Thus, this review cannot comment on how patients valued and experienced their exposure to manual therapies or passive physical modalities. Although the composition of the guideline panel was diverse, with experienced methodologists, expert clinicians, and stakeholder and patient representatives, only 1 member was from another health discipline (physiotherapist). The scope of this guideline focused on selected outcomes such as pain and disability, although included studies assessed several additional outcomes. People should receive care based on evidence-based therapeutic options. 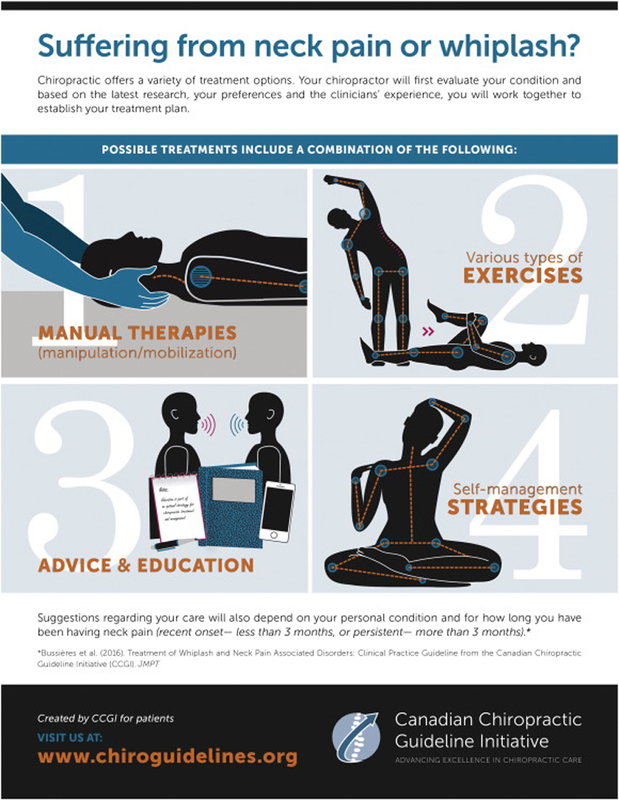 Based on patient preference and resources available, a mixed multimodal approach including manual therapy and advice about self-management and exercise (supervised/unsupervised or at home) may be an effective treatment strategy for recent-onset and persistent NAD and WAD grades I to III. Progress should be regularly monitored for evidence of benefit, in particular on the basis of pain alleviation and reduction of disability. persistent neck pain– and whiplash-associated disorders. The Clinical Practice Guideline Initiative was launched by the Canadian Chiropractic Association (CCA) and the Canadian Federation of Chiropractic Regulatory and Education Accrediting Boards (CFCREAB or Federation) over a decade ago to develop clinical practice guidelines (CPGs) to improve chiropractic care delivery in Canada. This is now known as the Canadian Chiropractic Guideline Initiative (CCGI), a 6-year project (2012–2018) funded by chiropractic stakeholders in Canada (www.chiroguidelines.org). The scope of the Canadian Chiropractic Guideline Initiative (CCGI) is limited to non-specific musculoskeletal disorders. CPGs produced by the CCGI are developed using the best available evidence and involve stakeholders in a transparent and collaborative manner. Stakeholders include professional organizations, health care professionals, consumers, and organizations that fund or carry out research. CPGs should address multiple dimensions of decision making, including: effectiveness; harm events; quality of life; health-service delivery issues (i.e., dissemination and implementation); provider and patient compliance; and resources use and costs. While guidelines can encourage practitioners to conform to best practices and lead to improvements in care, reviews have demonstrated that dissemination of guidelines alone is rarely sufficient to optimise care. To date, very little knowledge translation research has addressed evidence-practice gaps in chiropractic. Recent advances on methods to conduct knowledge synthesis,  derive evidence-based recommendations,  adapt high quality guidelines,  and increase the uptake of Clinical Practice Guidelines (CPG) [5, 6] have prompted an update of the development, dissemination, implementation, evaluation, and revision (DIER-Plan) published in the Journal of the Canadian Chiropractic Association in 2004. The initial report described the CCA/CFCRB-CPG and its origins and mapped the plan for the DIER-Plan of each CPG. The report updates the structure, methods and procedures to develop, update or adapt guidelines, and proposes strategies to help disseminate and implement CPGs. Original research in knowledge translation (KT) is undertaken to reduce the evidence-practice gap. To accomplish its complex tasks, the CCGI is made of a Guideline Steering Committee and a Guideline Advisory Committee, a Guideline Development Group, a Guideline Implementation Group, graduate students, and an External Review Group. Committee members originate from several countries and represent a range of clinical and scientific disciplines or specialties (Appendix 1 Figure 1). The analytic framework of a guideline is a key element in guideline development. In this critical stage, the group defines which questions must be answered to arrive at a recommendation, which types of evidence and information are relevant to the analysis, and by what criteria that evidence will be evaluated. The analytic work encompasses the examination of scientific evidence, expert opinion, clinical experience, and other relevant information and the use of decision rules to translate that information into recommendations. It obliges the group to make explicit, a priori decisions about the outcomes of interests to arrive at a recommendation. The end product of the process is captured in the analytic logic of the guideline, the rationale for the recommendations. The Steering Committee commissioned to develop the guideline. The Guideline Advisory Committee (GAC) determines the feasibility of the requested guideline. The Steering Committee refers clinical guideline topics to the Editor of the CCGI. Provincial and national organisations representing practitioners register as stakeholders. They will be consulted throughout the guideline development process. Committee and Group members register interest. The scope, approach, and output of the process are developed. This process sets out what the guideline will – and will not – cover. Guideline Development Group is established during the scoping phase. Based on recent high-quality studies, a multidisciplinary expert panel considers the evidence of effectiveness, safety, cost-effectiveness, societal and ethical values, and patient experiences when formulating recommendations. Consultations take place on the draft guideline (external review phase). The final guideline is produced and submitted for publication. Paper-based and web-based practitioner guides are produced. Putting knowledge into action (practice) is a dynamic, iterative, and complex process. Success requires an integrated approach where all involved parties work together to select, tailor, and implement KT interventions. 2) to conduct research that balances rigor with relevance and employs study designs and methods appropriate for KT research. The KT Committee will undertake primary research projects to help understand barriers and enablers to guideline uptake, develop implementation tools alongside of CPGs, and develop and evaluate intervention to improve process of care and patient care. Guidelines produced, results and a set of preliminary conclusions of the research undertaken by the CCGI will be presented at various professional and scientific meetings, as well as in a series of articles to be published in publications that are considered to have the greatest impact and readership in the musculoskeletal area for our target audience. In addition, Clinical Practice Guidelines and tools to help disseminate and implement the guideline recommendations will be posted on the CCGI website (www.chiroguidelines.org), and links to the CCGI will be provided from stakeholder websites. Appendix 1 Figure 1. 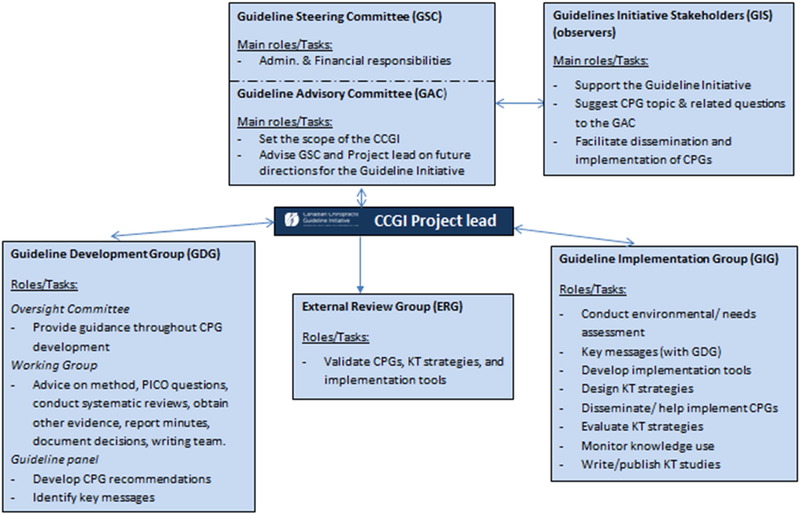 Structure of the Canadian Chiropractic Guideline Initiative (CCGI) 2012–2018. Graham G, Mancher M., Miller Wolman, D., Greenfield, S., Steinberg, E. Editors. Institute of Medicine, Shaping the Future for Health. Washington, DC: The National Academies Press. 2011. Tricco A, Tetzlaff J, Moher D.
The art and science of knowledge synthesis. http://www.gradeworkinggroup.org/ Accessed October 4, 2016. ADAPTE Manual and Resource Toolkit V2. Guideline International Network (G-I-N) Adaptation Working Group. Developing and Evaluating Communication Strategies to Support Informed Decisions and Practice Based on Evidence (DECIDE). Grimshaw J, Eccles M, Lavis J, Hill S, Squires J. The Canadian Chiropractic Association and the Canadian Federation of Chiropractic RegulatoryBoards Clinical Practice Guidelines Development Initiative (The CCA/CFCRB-CPG) development, dissemination, implementation, evaluation, and revision (DevDIER) plan. J Can Chiropr Assoc. 2004;48(1):56-72. Chenot J, Scherer M, Becker A, et al. Acceptance and perceived barriers of implementing a guideline for managing low back in general practice. Cabana M, Rand C, Powe N, Wu AW, Wilson MH, Abboud PA, Rubin,HR. Agency for Healthcare Research and Quality. Dissemination of Evidence-based Practice Center Reports. Sussman S, Valente T, Rohrbach L, Skara S, Pentz M.
Translation in the health professions: Converting science into action. Curran JA, Grimshaw JM, Hayden JA, Campbell B. Knowledge translation research: The science of moving research into policy and practice. J Continuing Edu Health Pro. 2011;31(3):174-180. Forsetlund L, Bjørndal A, Rashidian A, Jamtvedt, O'Brien MA, Wolf F, Davis D, Odgaard-Jensen J, Oxman AD. Cochrane Database Syst Rev. 2009;(2):CD003030. Giguère A, Légaré F, Grimshaw J, Turcotte S, Fiander M, Grudniewicz A, Makosso-Kallyth S, Wolf FM, Farmer AP, Gagnon MP. Cochrane Database of Systematic Reviews 2012(10):CD004398. Appendix 3. Glossary of Terms (Adapted from Côté et al. ). Sutton D, Cote P, Wong J, et al. Is multimodal care effective for the management of patients with whiplash-associated disorders or neck pain and associated disorders? A systematic review by the Ontario Protocol for Traffic Injury Management (OPTIMa) Collaboration. Monticone M, Baiardi P, Vanti C, et al. Maiers M, Bronfort G, Evans R, et al. Spinal manipulative therapy and exercise for seniors with chronic neck pain. Varatharajan S, Côté P, Shearer H, et al. Ontario Protocol for Traffic Injury Management (OPTIMa) Collaboration. Gram B, Andersen C, Zebis MK, et al. Effect of Training Supervision on Effectiveness of Strength Training for Reducing Neck/Shoulder Pain and Headache in Office Workers: Cluster Randomized Controlled Trial. Wong J, Shearer H, Mior S, et al. Dunning J, Cleland J, Waldrop M, et al. Upper cervical and upper thoracic thrust manipulation versus nonthrust mobilization in patients with mechanical neck pain: a multicenter randomized clinical trial. J Orthop Sports Phys Ther. 2012;42(1):5-18. Ali A, Shakil-ur-Rehman S, Sibtain FT. The efficacy of sustained natural apophyseal glides with and without isometric exercise training in non-specific neck pain. Pak J Med Sci. 2014;30(4):872-4. Akhter S, Khan M, SS. A, Soomro R.
Role of manual therapy with exercise regime versus exercise regime alone in the management of non-specific chronic neck pain. Pak J Pharma Sci. 2014;27(6 Suppl):2125-2128. Cohen S, Hayek S, Semenov Y, et al. Epidural Steroid Injections, Conservative Treatment, or Combination Treatment for Cervical Radicular PainA Multicenter, Randomized, Comparative-effectiveness Study. Fritz J, Thackeray A, Brennan G, et al. Exercise Only, Exercise With Mechanical Traction, or Exercise With Over-Door Traction for Patients With Cervical Radiculopathy, With or Without Consideration of Status on a Previously Described Subgrouping Rule: A Randomized Clinical Trial. Jull G, Kenardy J, Hendrikz J, et al. 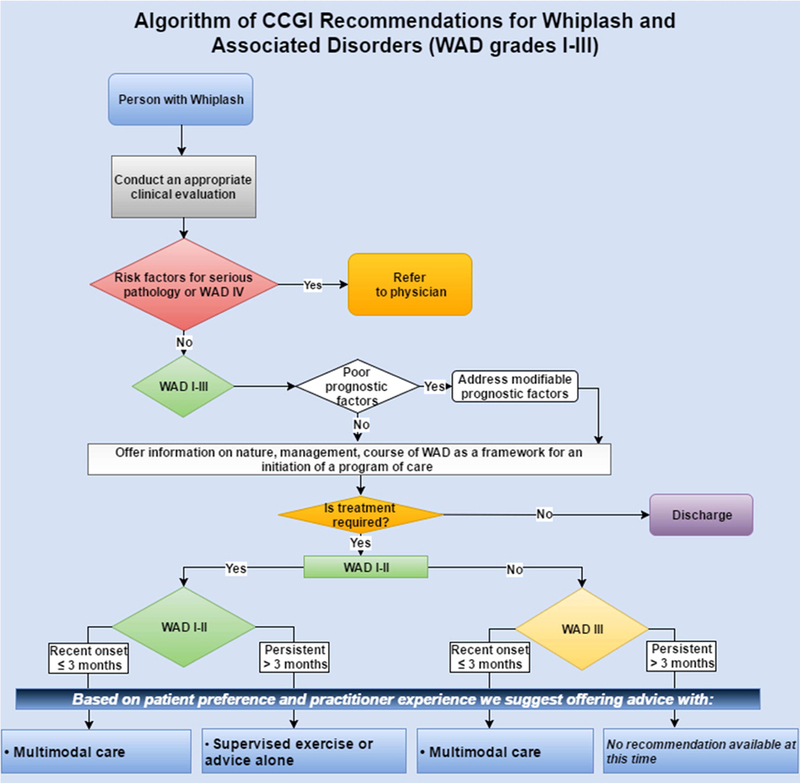 Management of acute whiplash: a randomized controlled trial of multidisciplinary stratified treatments. Letizia M, Cataldo P, Barbera G, et al. Alpha-Lipoic Acid and Superoxide Dismutase in the Management of Chronic Neck Pain: A Prospective Randomized Study. Llamas-Ramos R, Pecos-Martín D, Gallego-Izquierdo T, et al. J Orthop Sports Phys Ther. 2014;44(11):852-861. McLean S, Klaber Moffett J, Sharp D, et al. A randomised controlled trial comparing graded exercise treatment and usual physiotherapy for patients with non-specific neck pain (the GET UP neck pain trial). Multimodal treatment program comparing 2 different traction approaches for patients with discogenic cervical radiculopathy: a randomized controlled trial. Nihan C, Sebnem Koldas D, Deniz E, Saime A. The effectiveness of portable audio biofeedback device in myofascial pain syndrome in neck and upper trapezius muscles. Paoloni M, Tavernese E, Cacchio A, et al. Patient-oriented rehabilitation in the management of chronic mechanical neck pain: a randomized controlled trial. European journal of physical & rehabilitation medicine. Euro J Phys Rehabil Med. 2013;49(3):273-281. Sterling M, Vicenzino B, Souvlis T, et al. Dry-needling and exercise for chronic whiplash-associated disorders: a randomized single-blind placebo-controlled trial. Yu H, Côté P, Southerst D, Wong J, et al. Does structured patient education improve the recovery and clinical outcomes of patients with neck pain? A systematic review from the Ontario Protocol for Traffic Injury Management (OPTIMa) Collaboration. Lundqvist L, Zetterlund C, Richter H.
Effects of Feldenkrais method on chronic neck/scapular pain in people with visual impairment: a randomized controlled trial with one-year follow-up. Arch Phys Med Rehabil. 2014;95(9):1656-1661. Michaleff Z, Maher C, Lin C-WC, et al. Comprehensive physiotherapy exercise programme or advice for chronic whiplash (PROMISE): a pragmatic randomised controlled trial. Robinson J, Theodore B, Dansie E, et al. The role of fear of movement in subacute whiplash-associated disorders grades I and II. Southerst D, Nordin M, Côté P, et al. Jeitler M, Brunnhuber S, Meier L, et al. Effectiveness of jyoti meditation for patients with chronic neck pain and psychological distress-a randomized controlled clinical trial. Indian J. Med. Sci. 2011;65(11):424-428. Khan M, Soomro R, Ali S.
The effectiveness of isometric exercises as compared to general exercises in the management of chronic non-specific neck pain. Pakistan J Pharml Sci. 2014;27(5 Suppl):1719-1722. Hu Z, Tang Z, Wang S, et al. A 12-words-for-life-nurturing exercise program as an alternative therapy for cervical spondylosis: A randomized controlled trial. Evid Based Complement Alternat Med. 2014;2014:1-7. Lansinger B, Carlesson J, Kreuter M, et al. Health-related quality of life in persons with long-term neck pain after treatment with qigong and exercise therapy respectively. Ludvigsson M, Peterson G, O'Leary S, et al. The effect of neck-specific exercise with, or without a behavioral approach, on pain, disability, and self-efficacy in chronic whiplash-associated disorders: a randomized clinical trial. Rolving N, Christiansen D, Andersen L, et al. Effect of strength training in addition to general exercise in the rehabilitation of patients with non-specific neck pain. A randomized clinical trial. Euro J Phys Rehabil Med. 2014;50(6):617-626. Rudolfsson T, Djupsjobacka M, Hager C, et al. Effects of neck coordination exercise on sensorimotor function in chronic neck pain: a randomized controlled trial. Barene S, Krustrup P, Holtermann A. Effects of the workplace health promotion activities soccer and zumba on muscle pain, work ability and perceived physical exertion among female hospital employees. Dalager T, Bredahl T, Pedersen M, et al. Does training frequency and supervision affect compliance, performance and muscular health? A cluster randomized controlled trial. Gram B, Holtermann A, Bultmann U, et al. Does an exercise intervention improving aerobic capacity among construction workers also improve musculoskeletal pain, work ability, productivity, perceived physical exertion, and sick leave? : A randomized controlled trial. J Occup Environ Med. 2012;54(12):1520-1526. Rasotto C, Bergamin M, et al. A tailored workplace exercise program for women at risk for neck and upper limb musculoskeletal disorders: a randomized controlled trial. J Occup Environ Med. 2015;57(2):178-183. Sihawong R, Janwantanakul P, Jiamjarasrangsi W.
Effects of an exercise programme on preventing neck pain among office workers: a 12-month cluster-randomised controlled trial. Yu W, Yu IT, Wang X, et al. Effectiveness of participatory training for prevention of musculoskeletal disorders: a randomized controlled trial. Int Arch Occup Environ Health. 2013;86(4):431-440. Andersen C, Andersen. L, Gram B, et al. Influence of frequency and duration of strength training for effective management of neck and shoulder pain: a randomised controlled trial. British Journal of Sports Medicine. Br J Sports Med. 2012;46(14):1004-1010. Andersen C, Andersen L, Pedersen M, et al. Dose-response of strengthening exercise for treatment of severe neck pain in women. J Strength Cond Res. 2013;27(12):3322-3328. Pedersen M, Zebis M, Langberg H, et al. Influence of self-efficacy on compliance to workplace exercise. Int J Behav Med. 2013;20(3):365-370. Pedersen M, Andersen C, Zebis M, et al. Implementation of specific strength training among industrial laboratory technicians: long-term effects on back, neck and upper extremity pain. Roessler K, Rugulies R, ilberg R, et al. Does work-site physical activity improve self-reported psychosocial workplace factors and job satisfaction? A randomized controlled intervention study. Int Arch Environ Occup Health. 2013;86(8):861-864. Mortensen P, Larsen A, Zebis M, et al. Lasting effects of workplace strength training for neck/shoulder/arm pain among laboratory technicians: natural experiment with 3-year follow-up. Biomed Res Int. 2014; 2014: 845851. Zebis MK, Andersen CH, Sundstrup E, et al. Time-Wise Change in Neck Pain in Response to Rehabilitation with Specific Resistance Training: Implications for Exercise Prescription. Casanova-Méndez A, Oliva-Pascual-Vaca Á, Rodriguez-Blanco C, et al. Cook A, Wellman R, Cherkin D, et al. Randomized clinical trial assessing whether additional massage treatments for chronic neck pain improve 12- and 26-week outcomes. Izquierdo Pérez H, Alonso Perez J, Gil Martinez A, et al. Saavedra-Hernández M, Arroyo-Morales M, Cantarero-Villanueva I, et al. Short-term effects of spinal thrust joint manipulation in patients with chronic neck pain: a randomized clinical trial. Snodgrass S, Rivett D, Sterling M, et al. Dose optimization for spinal Treatment effectiveness: A randomized controlled trial investigating the effects of high and low mobilization forces in patients with neck pain. J Orthop Sports Phys Ther. 2014;44(3):141-152. Walker B, Hebert J, Stomski N, et al. Short-term usual chiropractic care for spinal pain: A randomized controlled trial. Abdel-Aziem A, Draz A, Battecha K, et al. Effect of ultrasound combined with conventional therapy on neck pain, function, and disability in patients with cervical spondylosis: A randomized placebo-controlled trial. Acedo A, Antunes A, Dos Santos A, et al. Upper trapezius relaxation induced by tens and interferential current in computer users with chronic nonspecific neck discomfort: An electromyographic analysis. J Back Musculoskelet rehabil. 2015;28(1):19-24. Andrade Ortega JA, Cerón Fernández E, García Llorent R et al. High power laser therapy treatment compared to simple segmental physical rehabilitation in whiplash injuries (1° and 2° grade of the Quebec Task Force classification) involving muscles and ligaments. Muscles Ligaments Tendons J. 2013;3(2):106-111. Dundar U, Turkmen U, Toktas H, et al. Effect of high-intensity laser therapy in the management of myofascial pain syndrome of the trapezius: a double-blind, placebo-controlled study. Gur A, Koca I, Karagullu H, et al. 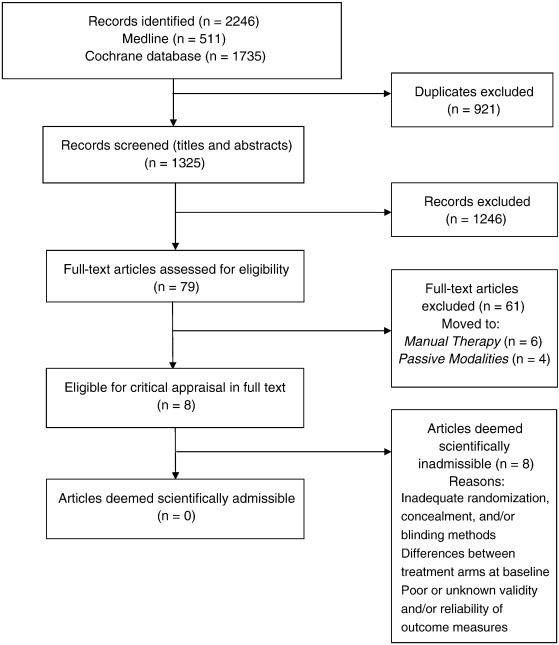 Comparison of the efficacy of ultrasound and extracorporeal shock wave therapies in patients with myofascial pain syndrome: A randomized controlled study. NOTE: Just to avoid confusion: The citation numbers in this Appendix refer to the Reference section contained within this Appendix, and do NOT refer to the 189 references listed at the bottom of this long article. This educational executive summary provides an overview of recommendations for clinical practice issued by CCGI in a new clinical practice guideline on the management of NAD and WAD. The full guideline and accompanying documents are available from the CCGI website at www.chiroguidelines.org. Summary of recommendations: A multimodal approach including manual therapy, self-management advice and exercise is an effective treatment strategy for both recent onset and persistent neck pain and whiplash associated disorders. For patients with recent (0-3 months) neck pain and associated disorders grades I-II, we suggest manipulation or mobilization based on patient preference. For patients with recent (0-3 months) neck pain grades I-II, we suggest ROM home exercises or multimodal manual therapy for reduction in pain and disability.Remark: Home exercises include education self-care advice, exercises and instruction of activity of daily living. Medication including non-steroidal anti-inflammatory drugs (NSAIDs), acetaminophen and muscle relaxant is an alternative. Multimodal manual therapy includes manipulation and mobilization with limited light soft-tissue massage, assisted stretching, hot and cold packs, and advice to stay active or modify activity as needed. For patients with recent (0-3 months) grade III neck and arm pain, we suggest supervised graded strengthening exercises* rather than advice alone**.Remark: *Supervised graded strengthening exercises consisted of strengthening and stability exercises twice a week for 6 weeks with daily home exercises (which included mobility, stability and muscle strengthening). **Advice consisted of maintaining activity of normal life without specific treatment. For adult patients with recent (0-3 months) WAD grades I-III, we suggest multimodal care over education alone.Remark: Multimodal care may consist of manual therapy (joint mobilization), other soft tissue techniques, education and exercises. For adult patients with persistent (over 6 months duration) neck pain grades I-II, we suggest supervised group exercise* to reduce neck pain and disability.Remark: Patients received 18-24 group sessions during a period of 4 to 6 months. Patients considered had a rating of 40/100 on a pain scale (VAS). The intervention group reached suggested MCID level of 10% difference for pain and functional outcomes. *Exercises included qigong or ROM, flexibility and strengthening exercises. No evidence of significant effect in the elderly population. For patients with persistent (over 3 months) grades I-II neck pain and disability, we suggest supervised yoga over education and home exercises for short-term improvement in neck pain and disability.Remark: Baseline intensity of pain was more than 40/100 and at least 3 months duration. Yoga was specific to Iyengar type, with a maximum of 9 sessions over 9 weeks. For patients with persistent (over 3 months) grades I-II neck pain, we suggest supervised strengthening exercises or home exercises.Remark: For reduction in pain, supervised strengthening exercises, provided along with ROM exercises and advice, interventions were evaluated at 12 weeks within 20 sessions. Home exercises include stretching or self-mobilization. For patients with persistent (over 3 months) neck pain and associated disorders grades I-II, we suggest multimodal care* or stress self-management** based on patient preference, prior response to care and resources available.Remark: *Individualized multimodal care may include manual therapy (manipulation, mobilization, massage, traction), acupuncture, heat, transcutaneous electrical nerve stimulation, exercise, and/or ultrasound. **Stress self-management may include relaxation, balance and body awareness exercises, pain and stress self-management lectures and discussion. The multimodal care group received an average of 7 (range 4-8) sessions, compared to 11 (range 1-52) sessions for stress self-management group over 20 weeks. For patients with persistent (over 3 months) neck pain grades I-II, we suggest manipulation in conjunction with soft tissue therapy.Remark: Evaluated after eight 20 min sessions (over a three week period). Does not include manipulation as a stand-alone treatment. For patients with persistent (over 3 months) neck pain and associated disorders grade I-II, we suggest high-dose massage over wait listing based on patient preferences and resources available.Remark: Interventions were given 3 X 60 min a week over 4 weeks. Lower dosages and duration did not have therapeutic benefit, and we cannot suggest offering as an option. For patients presenting with persistent (over 3 months) neck pain grades I-III, we suggest clinicians offer *multimodal care and/or **practitioner advice based on patient preference.Remark: * Multimodal care and exercises may consist of thrust/non-thrust joint manipulation; muscle energy, stretching and home exercises (cervical retraction, deep neck flexor strengthening, cervical rotation ROM). ** Multimodal minimal intervention may consist of postural advice; encouragement to maintain neck motion and daily activities; cervical rotation ROM exercise; instructions to continue prescribed medication; therapeutic pulsed (10%) ultrasound at 0.1 W/cm2 for 10 minutes applied to the neck and cervical ROM exercises. For workers with persistent (over 3 months) neck and shoulder pain, we suggest mixed supervised and unsupervised high-intensity strength training or advice alone.Remark: For reduction in pain intensity, 3 sessions per week, each lasting 20 minutes over a 20-week period. Exercise includes strengthening. Extra resources are likely required for complete exercise intervention implementation. For patients with persistent (over 3 months) grades I-II WAD, we suggest supervised exercises with advice or advice alone based on patient preference and resources available.Remark: Extra resources may be required for supervised exercises. Recommendations proposed in this guideline are derived from the best available evidence for the treatment of Neck Pain Associated and Whiplash Associated Disorders. Clinicians should always aim to incorporate the best evidence available to inform clinical decision making. The certainty in the evidence (also known as quality of evidence or confidence in the estimates) is assessed for each important outcome using these categories: high, moderate, low. Randomized trials begin as high quality evidence. Quality may be downgraded as a result of limitations in study design or implementation, imprecision of estimates (wide confidence intervals), variability in results, indirectness of evidence, or publication bias. The quality of the evidence of included randomized controlled trials ranged between low and moderate. Based on available evidence, the quality of the recommendation indicates the extent to which one can be confident that adherence to the recommendation will do more good than harm. Strength of recommendation is determined by the balance between desirable and undesirable consequences of alternative management strategies, quality of evidence, variability in values and preferences, and resource use. Overall, the strength of the evidence of the recommendations for this guideline is weak. Weak recommendations mean that patients’ choices will vary according to their values and preferences, and clinicians must ensure that patients’ care is in keeping with their values and preferences. Recommendations for structured patient education are included in the exercise intervention section of this guideline. The panel decided not to repeat these findings in the current section and felt that the benefits of increasing the frequency and intensity of exercise regimes was not restricted to those working in an industrial environment, or to any specific population sub-group with the exception of older adults. Evidence on Work Disability Prevention interventions was considered, but the panel decided not to provide practice recommendations because of the uncertainty surrounding judgments on the evidence. The evidence-based practice guidelines published by the CCGI include recommendations intended to optimize patient care that are informed by a systematic review of evidence and an assessment of the benefits and harms of alternative care options. Guidelines are intended to inform clinical decision making, are not prescriptive in nature, and do not replace professional chiropractic care or advice, which always should be sought for any specific condition. Furthermore, guidelines may not be complete or accurate because new studies that have been published too late in the process of guideline development or after publication are not incorporated into any particular guideline before it is disseminated. CCGI and its working group members, executive committee, and stakeholders (the “CCGI Parties”) disclaim all liability for the accuracy or completeness of a guideline, and disclaim all warranties, expressed or implied. Guideline users are urged to seek out newer information that might impact the diagnostic and/or treatment recommendations contained within a guideline. The CCGI Parties further disclaim all liability for any damages whatsoever (including, without limitation, direct, indirect, incidental, punitive, or consequential damages) arising out of the use, inability to use, or the results of use of a guideline, any references used in a guideline, or the materials, information, or procedures contained in a guideline, based on any legal theory whatsoever and whether or not there was advice of the possibility of such damages. Concept development (provided idea for the research): A.B., J.O., G.S. Design (planned the methods to generate the results): A.B., J.O., G.S. Supervision (provided oversight, responsible for organization and implementation, writing of the manuscript): A.B., J.O., G.S. Data collection/processing (responsible for experiments, patient management, organization, or reporting data): A.B., J.O., G.S., F.A.Z. Analysis/interpretation (responsible for statistical analysis, evaluation, and presentation of the results): J.O., A.B., M.D., M.S., C.H. Literature search (performed the literature search): A.B., F.A.Z. Writing (responsible for writing a substantive part of the manuscript): A.B., J.O., G.S., F.A.Z., J.S., J.W., M.D., M.S., I.P., S.P., C.H., J.H. Critical review (revised manuscript for intellectual content, this does not relate to spelling and grammar checking): A.B., J.O., G.S., F.A.Z., J.S., J.W., M.D., M.S., I.P., S.P., C.H., J.H. We thank the following people for their contributions to this paper: Dr. John Riva, DC, observer; Heather Owens, Research Coordinator, proofreading; Cameron McAlpine (Director of Communication & Marketing, Ontario Chiropractic Association), for assistance in producing the companion document intended for patients with NAD; members of the guideline panel who served on the Delphi consensus panel, who made this project possible by generously donating their expertise and clinical judgment. Ferrari, R. and Russell, A. Regional musculoskeletal conditions: neck pain. Holm, L., Carroll, L., Cassidy, J.D. et al. Côté, P., van der Velde, G., Cassidy, J.D. et al. Decade 2000-2010 Task Force on Neck Pain and Its Associated Disorders. Vos, T., Flaxman, A., Naghavi, M. et al. The Treatment of Neck and Low Back Pain: Seeks Care? Who Goes Where? Hoy, D.G., Protani, M., De, R., and Buchbinder, R.
Murray, C., Abraham, J., Ali, M. et al. Manchikanti, L., Singh, V., Datta, S., Cohen, S., and Hirsch, J. Physicians. ASoIP. Comprehensive review of epidemiology, scope, and impact of spinal pain. Hincapié, C., Cassidy, J., Côté, P., Carroll, L., and Guzmán, J.
Blincoe, L., Miller, T., Zaloshnja, E., and Lawrence, B.
Bannister, G., Amirfeyz, R., Kelley, S., and Gargan, M.
Johansson, M., Boyle, E., Hartvigsen, J., Carroll, L., and Cassidy, J.
Styrke, J., Stalnacke, B., Bylund, P., and Sojka, P.
in a defined population in northern Sweden. Ontario Auto Insurance Anti-Fraud Task Force Interim Report. Karlsborg, M., Smed, A., Jespersen, H. et al. A prospective study of 39 patients with whiplash injury. Sterling, M., Jull, G., Vicenzino, B., Kenardy, J., and Darnell, R.
Guzman, J., Hurwitz, E.L., Carroll, L.J. et al. Leaver, A., Maher, C., McAuley, J., Jull, G., and Refshauge, K.
Characteristics of a new episode of neck pain. Côté, P., Shearer, H., Ameis, A. et al. Clar, C., Tsertsvadze, A., Court, R., Hundt, G., Clarke, A., and Sutcliffe, P.
and non-musculoskeletal conditions: systematic review and update of UK evidence report. Bronfort, G., Evans, R., Anderson, A., Svendsen, K., Bracha, Y., and Grimm, R.
Bryans, R., Decina, P., Descarreaux, M. et al. Shaw, L., Descarreaux, M., Bryans, R. et al. Côté, P., Wong, J.J., Sutton, D. et al. Johnson, A.P., Sikich, N.J., Evans, G. et al. Shukla, V., Bai, A., Milne, S., and Wells, G.
Systematic review of the evidence grading system for grading level of evidence. Mustafa, R.A., Santesso, N., Brozek, J. et al. Woolf, S., Schunemann, H., Eccles, M., Grimshaw, J., and Shekelle, P.
values and economics, synthesis, grading, and presentation and deriving recommendations. Tricco, A., Tetzlaff, J., and Moher, D.
Guyatt, G., Eikelboom, J.W., Akl, E.A. et al. A guide to GRADE guidelines for the readers of JTH.. Adaptation. The ADAPTE Manual and Resource Toolkit V2. Brouwers, M., Kho, M., Browman, G. et al. Flottorp, S., Oxman, A.D., Cooper, J.G., Hjortdahl, P., Sandberg, S., and Vorland, L.H. Retningslinjer for diagnostikk og behandling av sar hals. Grimshaw, J., Eccles, M., Lavis, J., Hill, S., and Squires, J.
Southerst, D., Nordin, M., Côté, P. et al. for Traffic Injury Management (OPTIMa) Collaboration. Sutton, D., Cote, P., Wong, J. et al. Yu, H., Côté, P., Southerst, D., Wong, J. et al. Varatharajan, S., Côté, P., Shearer, H. et al. Wong, J.J., Shearer, H.M., Mior, S. et al. on Neck Pain and Its Associated Disorders by the Optima Collaboration. Shea, B., Grimshaw, J., Wells, G., Boers, M., Andersson, N., and Hamel, C.
Biostatistics: The Bare Essentials. 3rd ed. Hamilton, ON: BC Decker; 2008. Ricci, S., Celani, M., and Righetti, E.
van der Velde, G., van Tulder, M., Côté, P. et al. incorporate trial quality into data synthesis. Guyatt, G., Oxman, A., Vist, G. et al. Guyatt, G., Oxman, A., Akl, E., Kunz, R., Vist, G., Brozek, J. et al. GRADE guidelines 1. Introduction: GRADE evidence profiles and summary of findings tables. Treweek, S., Oxman, A., Alderson, P. et al. decisions and practice based on evidence (DECIDE): protocol and preliminary results. McCarthy, M., Grevitt, M., Silcocks, P., and Hobbs, G.
Stauffer, M., Taylor, S., Watson, D., Peloso, P., and Morrison, A.
difference on the pain visual analog scale. Hawker, G.A., Mian, S., Kendzerska, T., and French, M.
Blozik, E., Himmel, W., Kochen, M.M., Herrmann-Lingen, C., and Scherer, M.
Andrews, J., Guyatt, G., Oxman, A.D. et al. the significance and presentation of recommendations. Andrews, J.C., Schünemann, H.J., Oxman, A.D. et al. Black, N., Murphy, M., Lamping, D., McKee, M., Sanderson, C., and Askham, J.
Seo, H.-J. and Kim, K.U. Leaver, A., Maher, C., Herbert, R. et al. Dunning, J., Cleland, J., Waldrop, M. et al. in patients with mechanical neck pain: a multicenter randomized clinical trial. Nagrale, A., Glynn, P., Joshi, A., and Ramteke, G.
trigger points in subjects with non-specific neck pain: a randomized controlled trial. McReynolds, T. and Sheridan, B.
of acute neck pain in the emergency department: a randomized clinical trial. Chou, R., Turner, J.A., Devine, E.B. et al. Prevention Workshop Effectiveness and Risks of Long-Term Opioid Therapy for Chronic Pain. Kuijper, B., Tans, J., Beelen, A., Nollet, F., and de Visser, M.
onset cervical radiculopathy: randomised trial. Mobilisation or immobilisation for cervical radiculopathy? Konstantinovic, L., Cutovic, M., Milovanovic, A. et al. a double-blind placebo-controlled randomized study. van den Heuvel, S., de Looze, M., Hildebrandt, V., and Thé, K.
Lamb, S., Gates, S., Williams, M. et al. a pragmatic, two-step, randomised controlled trial. Ferrari, R., Rowe, B.H., Majumdar, S.R. et al. results of a randomized, controlled trial. von Trott, P., Wiedemann, A., Lüdtke, R., Reißhauer, A., Willich, S., and Witt, C.
Rendant, D., Pach, D., Ludtke, R. et al. Michalsen, A., Traitteur, H., Lüdtke, R. et al. Yoga for chronic neck pain: a pilot randomized controlled clinical trial. Jeitler, M., Brunnhuber, S., Meier, L. et al. psychological distress-a randomized controlled clinical trial. Hakkinen, A., Kautiainen, H., Hannonen, P., and Ylinen, J.
with chronic neck pain: a randomized one-year follow-up study. Salo, P., Ylonen-Kayra, N., Hakkinen, A., Kautiainen, H., Malkia, E., and Ylinen, J.
with chronic neck pain: a randomized study with a 1-year follow-up. Evans, R., Bronfort, G., Schulz, G. et al. Maiers, M., Bronfort, G., Evans, R. et al. Griffiths, C., Dziedzic, K., Waterfield, J., and Sim, J.
program for chronic neck disorders: a randomized controlled trial. Gustavsson, C., Denison, E., and von Koch, L.
group intervention in primary health care. trial of a multicomponent group intervention in primary health care. Sherman, K., Cherkin, D., Hawkes, R., Miglioretti, D., and Deyo, R.
Lin, J., Shen, T., Chung, R., and Chiu, T.
Lauche, R., Materdey, S., Cramer, H. et al. in patients with chronic neck pain—a randomized controlled trial. Sherman, K., Cook, A., Wellman, R. et al. Five-week outcomes from a dosing trial of therapeutic massage for chronic neck pain. Walker, M.J., Boyles, R.E., Young, B.A. et al. Boyles, R., Walker, M., Young, B., Strunce, J., and Wainner, R.
in patients treated for mechanical neck pain: a secondary analysis. Hoving, J.L., de Vet, H.C., Koes, B.W. et al. Hoving, J.L., Koes, B.W., de Vet, H.C.W. et al. Monticone, M., Baiardi, P., Vanti, C. et al. results of a randomised controlled clinical trial. Zebis, M., Andersen, L., Pedersen, M. et al. Zebis, M.K., Andersen, C.H., Sundstrup, E., Pedersen, M.T., Sjøgaard, G., and Andersen, L.L. resistance training: implications for exercise prescription. Andersen, C., Andersen, L., Gram, B. et al. neck and shoulder pain: a randomised controlled trial. Andersen, L., Jorgensen, M., Blangsted, A., Pedersen, M., Hansen, E., and Sjogaard, G.
A. randomized controlled intervention trial to relieve and prevent neck/shoulder pain. Sjogren, T., Nissinen, K., Jarvenpaa, S., Ojanen, M., Vanharanta, H., and Malkia, E.
office workers: a cluster randomized controlled cross-over trial. Stewart, M., Maher, C., Refshauge, K., Herbert, R., Bogduk, N., and Nicholas, M.
Michaleff, Z. and Maher, C. Lin C-WC, et al. (PROMISE): a pragmatic randomised controlled trial. Gram, B., Andersen, C., Zebis, M.K. et al. Jull, G., Sterling, M., Kenardy, J., and Beller, E.
physical rehabilitation for chronic whiplash? A preliminary RCT..
Jull, G., Kenardy, J., Hendrikz, J., Cohen, M., and Sterling, M.
Wiangkham, T., Duda, J., Haque, S., Madi, M., and Rushton, A. 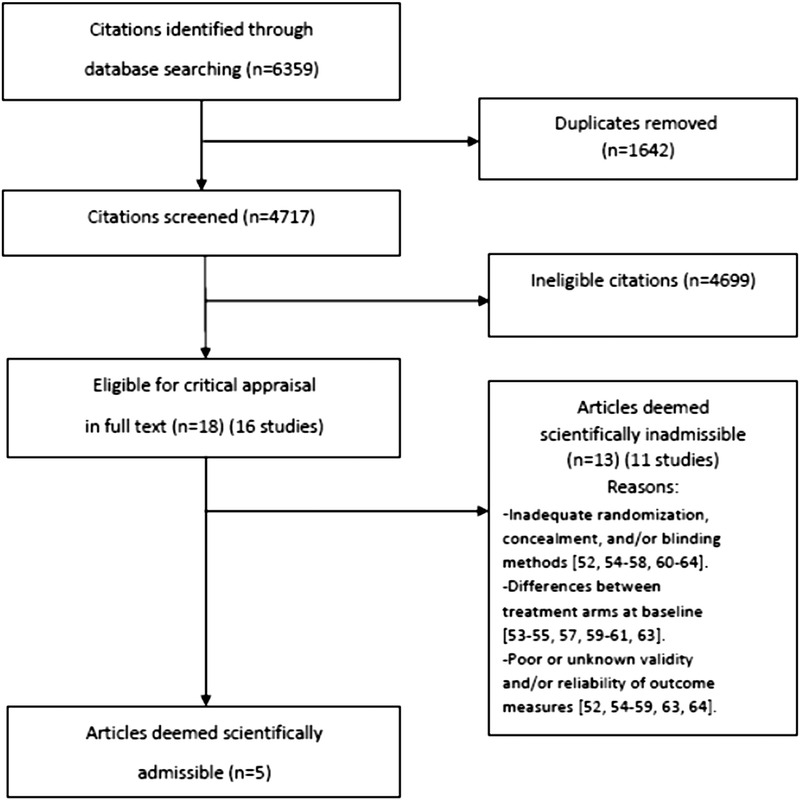 (WAD) II: a systematic review and meta-analysis of randomised controlled trials. Guyatt, G., Oxman, A.D., Sultan, S. et al. for a single outcome and for all outcomes. Walsh, D., Howe, T., Johnson, M., and Sluka, K.
Nnoaham, K. and Kumbang, J.
Transcutaneous electrical nerve stimulation (TENS) for chronic pain. French, S., Cameron, M., Walker, B., Reggars, J., and Esterman, A.
Malanga, G.A., Yan, N., and Stark, J.
Carnes, D., Mullinger, B., and Underwood, M.
Haldeman, S., Carroll, L.J., and Cassidy, J.D. the Bone and Joint Decade 2000-2010 Task Force on Neck Pain and Its Associated Disorders. Maiers, M., Vihstadt, C., Hanson, L., and Evans, R.
Chou, R., Deyo, R., Friedly, J. et al. Noninvasive treatments for low back pain. Comparative Effectiveness Review No. 169. (Prepared by the Pacific Northwest Evidence-based Practice Center under Contract No. 290-2012-00014-I.). Machado, G., Maher, C., Ferreira, P. et al. 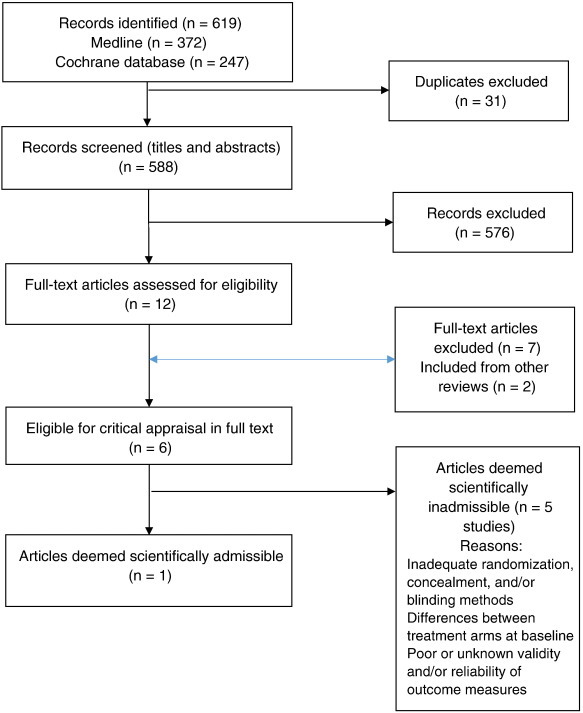 systematic review and meta-analysis of randomised placebo controlled trials. Miller, M., Barber, C.W., Leatherman, S. et al. among patients receiving opioid therapy. Volkow, N. and McLellan, A.
Opioid abuse in chronic pain—misconceptions and mitigation strategies. Foster, N., Hartvigsen, J., and Croft, P.
musculoskeletal pain: a review and critical analysis. Geneva, Switzerland: World Health Organization; 2005. Dietl, M. and Korczak, D.
Over-, under- and misuse of pain treatment in Germany. Freburger, J., Carey, T., Holmes, G., Wallace, A., Castel, L., and Darter, J. Exercise prescription for chronic back or neck pain: who prescribes it? Who gets it? What is prescribed? Goode, A., Freburger, J., and Carey, T.
Kamaleri, Y., Natvig, B., Ihlebaek, C.M., and Bruusgaard, D.
MacDermid, J., Miller, J., and Gross, A. Knowledge translation tools are emerging to move neck pain research into practice. Medina-Mirapeix, F., Escolar-Reina, P., Gascon-Canovas, J., Montilla-Herrador, J., Jimeno-Serrano. home exercise programs for neck and low back pain: an observational study. Kay, T., Gross, A., Goldsmith, C. et al. Bertozzi, L., Gardenghi, I., Turoni, F. et al. 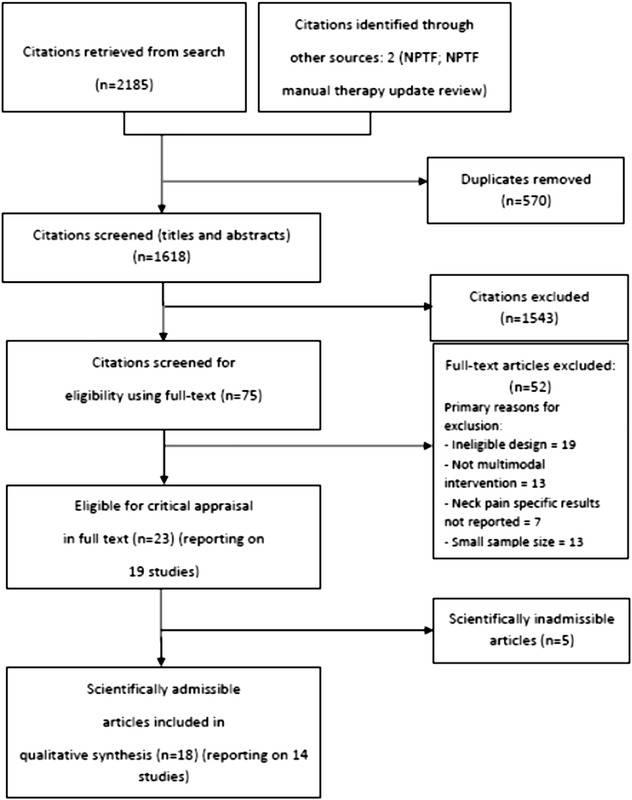 chronic nonspecific neck pain: systematic review and meta-analysis of randomized trials. Hartvigsen, J., Natvig, B., and Ferreira, M.
Ambrose, K. and Golightly, Y. Physical exercise as non-pharmacological treatment of chronic pain: why and when. Lee, I., Shiroma, E., Lobelo, F., Puska, P., Blair, S., and Katzmarzyk, P.
an analysis of burden of disease and life expectancy. Geneva, Switzerland: World Health Organization; 2010. Carroll, L.J., Ferrari, R., Cassidy, J.D., and Cote, P.
strategies is associated with slower recovery of neck pain and pain-related disability. Gore, M., Sadosky, A., Stacey, B., Tai, K., and Leslie, D.
Bodenheimer T, MacGregor K, Charifi C.
Helping patients manage their chronic conditions. Oakland, CA: California HealthCare Foundation; 2005. Ritzwoller, D., Crounse, L., Shetterly, S., and Rublee, D.
Sallis, R., Franklin, B., Joy, L., Ross, R., Sabgir, D., and Stone, J. Strategies for promoting physical activity in clinical practice. Von Korff, M., Crane, P., Lane, M. et al. Bussières, A., Al Zoubi, F., Quon, J. et al. Fast tracking the design of theory-based KT interventions through a consensus process. Gutnick, D., Reims, K., Davis, C., Gainforth, H., Jay, M., and Cole, S.
Brief action planning to facilitate behavior change and support patient self-management. Dhopte, P., Ahmed, S., Mayo, N., French, S., Quon, J.A., and Bussières, A.
study protocol for a pilot cluster-randomized controlled trial. Turner, L., Shamseer, L., Altman, D. et al. of reporting of randomised controlled trials (RCTs) published in medical journals. Quinlan, K., Annest, J., Myers, B., Ryan, G., and Hill, H.
Neck strains and sprains among motor vehicle occupants—United States, 2000. The evidence for evidence-based practice implementation. An Evidence-Based Handbook for Nurses. vol. 1. The Canadian Agency for Drugs and Technologies in Health. Grimshaw, J., Thomas, R., MacLennan, G., Fraser, C., Ramsay, C., and Vale, L.
Grimshaw, J., Schunemann, H., Burgers, J., Cruz, A., Heffner, J., and Metersky, M.
Article 13 in integrating and coordinating efforts in COPD guideline development. Enhancing physicians' use of clinical guidelines. Schuster, MA, Elizabeth A, McGlynn R, Brook H.
Greenhalgh, T., Howick, J., and Maskrey, N.
Gagliardi, A., Marshall, C., Huckson, S., James, R., and Moore, V.
review and synthesis of guideline development and implementation advice. Gagliardi, A., Brouwers, M., and Bhattacharyya, O.
Delphi survey and assessment of GItools. Okelo, S., Butz, A., Sharma, R. et al. Murthy, L., Shepperd, S., Clarke, M. et al. by health system managers, policy makers and clinicians. Garg, A., Adhikari, N., McDonald, H. et al. 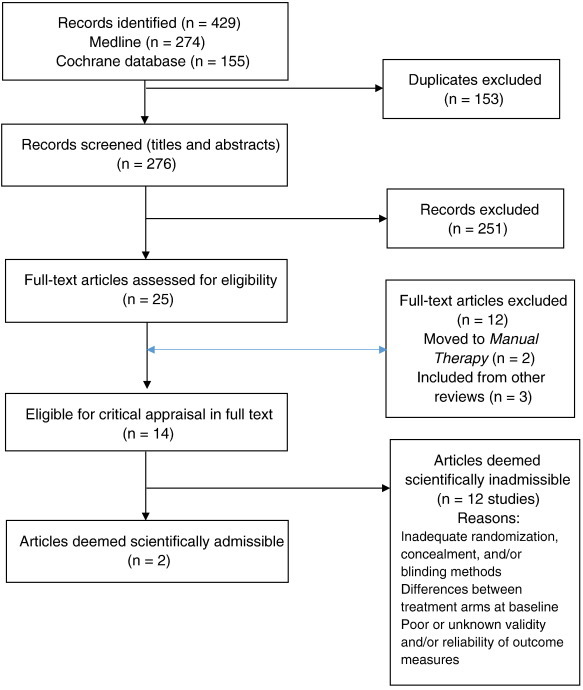 performance and patient outcomes: a systematic review. Rebbeck, T., Macedo, L., and Maher, C.
targeted implementation strategy: a prospective cohort study. Bussières, A., Côté, P., French, S. et al. enhancing the management of musculoskeletal care. Canadian Chiropractic Research Database (CCRD). National Report. Becker, M., Neugebauer, E., and Eikermann, M.
Alonso-Coello, P., Martínez García, L., Carrasco, J.M., Solà, I., Qureshi, S., and Burgers, J.S. The updating of clinical practice guidelines: insights from an international survey. Martínez García, L., Arévalo-Rodríguez, I., Solà, I., Haynes, R., Vandvik, P.
Moher D, Tsertsvadze A, Tricco A, et al. 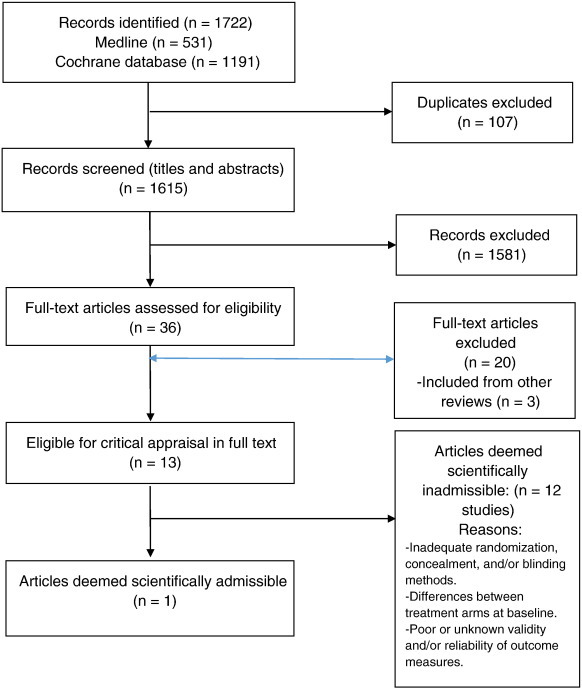 when and how to update systematic reviews. Shekelle, P., Eccles, M., Grimshaw, J., and Woolf, S.
When should clinical guidelines be updated? Vernooij, R., Sanabria, A., Sola, I., Alonso-Coello, P.
a systematic review of methodological handbooks. 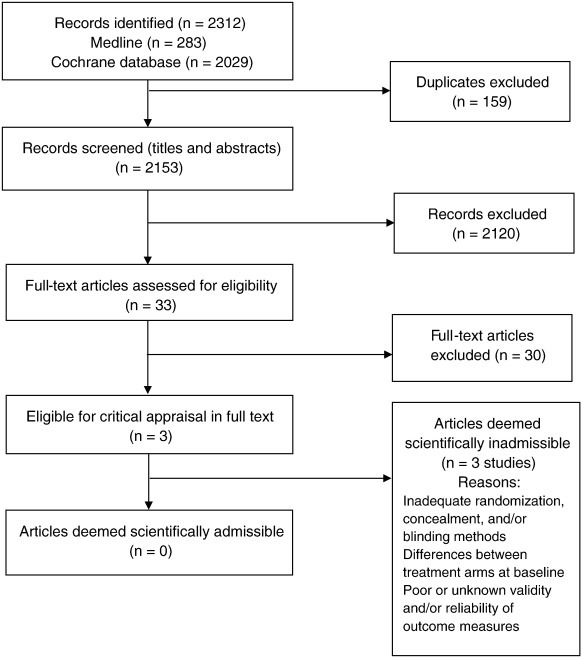 Moher, D., Pham, B., Lawson, M., and Klassen, T.
other than English in systematic reviews. Morrison, A., Polisena, J., Husereau, D. et al. 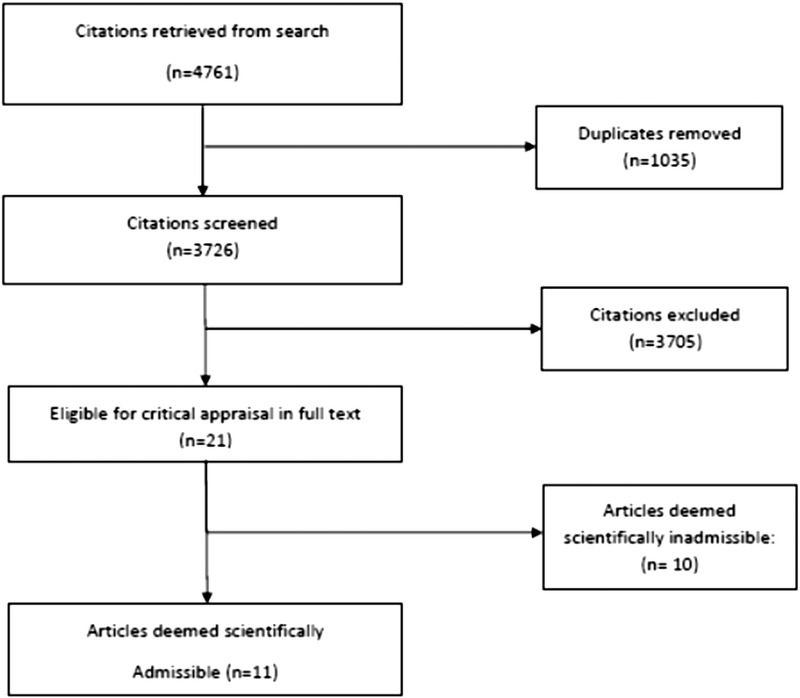 meta-analyses: a systematic review of empirical studies. Harbour, R. and Miller, J.A. new system for grading recommendations in evidence based guidelines. Cleland, J., Mintken, P., Carpenter, K. et al. cervical range of motion exercise: multi-center randomized clinical trial. Escortell-Mayor, E., Riesgo-Fuertes, R., Garrido-Elustondo, S. et al. with TENS in patients with neck pain. Lamb, S., Williams, M., Williamson, E. et al. Pool, J., Ostelo, R., Knol, D., Vlaeyen, J., Bouter, L., and de Vet, H.I. patients with subacute neck pain? : results of a randomized clinical trial. Skillgate, E., Bohman, T., Holm, L., Vingård, E., and Alfredsson, L.
The long-term effects of naprapathic manual therapy on back and neck pain. Results from a pragmatic randomized controlled trial. Kongsted, A., Qerama, E., Kasch, H. et al. Education of patients after whiplash injury: is oral advice any better than a pamphlet? Andersen, L., Saervoll, C., Mortensen, O., Poulsen, O., Hannerz, H., and Zebis, M.
frequent neck/shoulder pain: Randomised controlled trial. Cheng, A. and Hung, L.
Feuerstein, M., Nicholas, R., Huang, G., Dimberg, L., Ali, D., and Rogers, H.
van Eijsden-Besseling, M., Bart Staal, J., van Attekum, A., de Bie, R.A.
Cameron, I., Wang, E., and Sindhusake, D.A. Cleland, J.A., Glynn, P.E., Whitman, J.M. et al. patients with mechanical neck pain: preliminary analysis of a randomized clinical trial. Dundar, U., Evcik, D., Samli, F., Pusak, H., and Kavuncu, V.
cervical myofascial pain syndrome: a double blind, placebo-controlled study. Fu, W., Zhu, X., Yu, P., and Zhang, J.
Kanlayanaphotporn, R., Chiradejnant, A., and Vachalathiti, R.
in patients presenting with unilateral neck pain: a randomized controlled trial. on pain and range of motion in patients with mechanical neck pain. Klein, R., Bareis, A., Schneider, A., and Linde, K.
in patients with neck pain: a sham-controlled randomized trial. Liang, Z., Zhu, X., Yang, X., Fu, W., and Lu, A.
a pilot randomised controlled study. Masaracchio, M., Cleland, J.A., Hellman, M., and Hagins, M.
Saavedra-Hernandez, M., Castro-Sanchez, A., Arroyo-Morales, M. et al. in patients with mechanical neck pain: a randomized clinical trial. Sillevis, R., Hellman, M., and Beekhuizen, K.
autonomic nervous system: a randomized clinical trial. White, P., Lewith, G., Prescott, P., and Conway, J. Young, I., Cleland, J., Aguilera, A. et al.